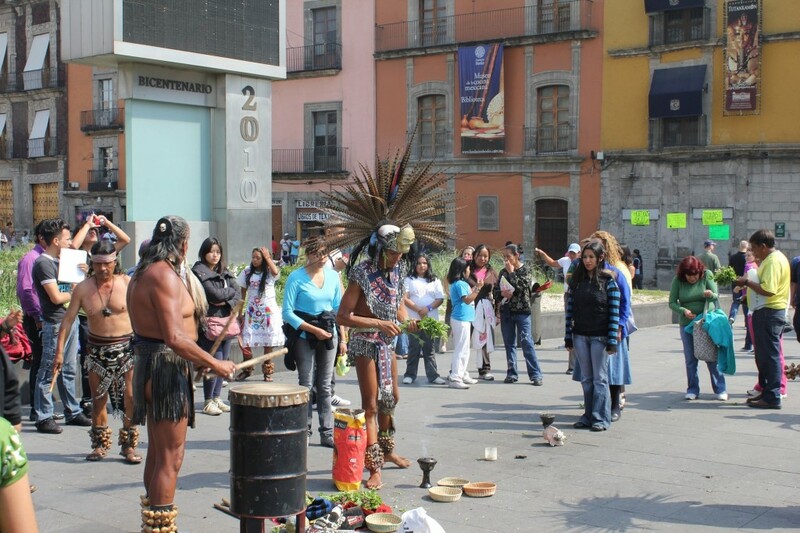 Home » Posts Tagged "indigenous history"
Unitierra, as an autonomous learning movement and as an experiment of higher education, has helped to spark other Unitierras in the Americas – in Puebla (a city in Mexico), in San Cristobal de la Casas in Chiapas and most recently, in California, in the United States. We decided to take the opportunity of arranging a short visit to CIDECI-Unitierra (Centro Indigena de Capacitacion Integral – roughly translated as ‘An Indigenous Centre for Integral Learning’) in San Cristobal de la Casas and learn more about what they were doing as connected and separate from the Unitierra in Oaxaca within which, we had just spent 12 inspiring days (see the previous 8 posts that are related to Unitierra-Oaxaca). 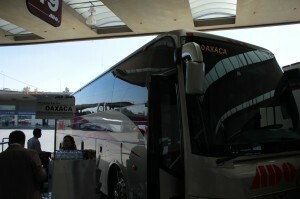 Buses from Oaxaca to Chiapas go only at night. The journey lasts for an intense 11 hours of very windy roads. 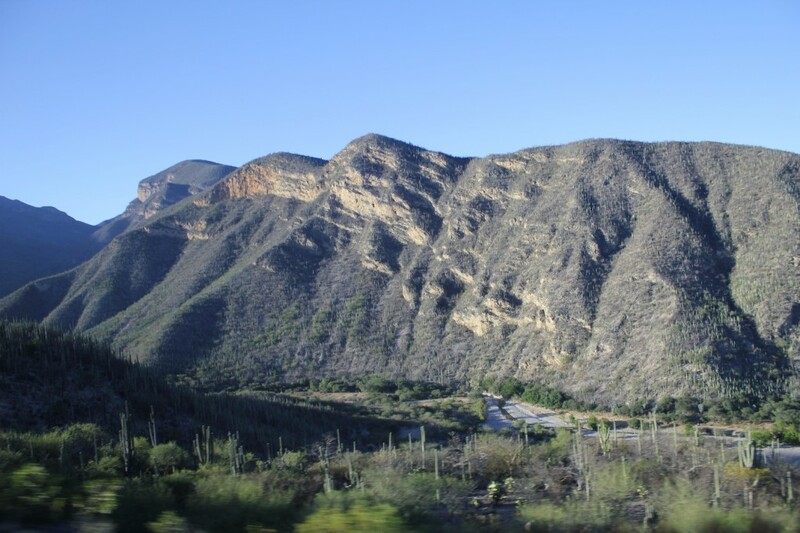 Udi and I were both unable to do any reading or even much concentrating after only 30 minutes into the journey as all roads out of the valley of Oaxaca City become so immediately tortuous. 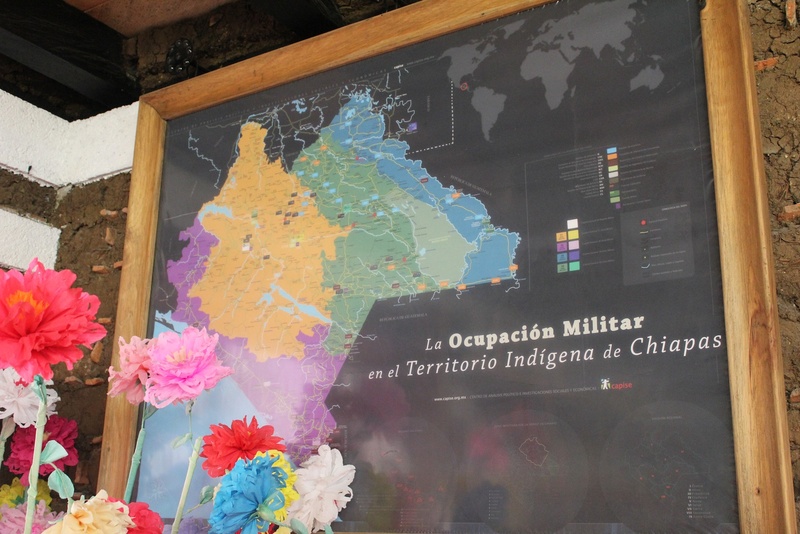 We had contacted Raymundo Sanchez Barraza, the primary organiser of CIDECI-Unitierra, in San Cristobal, Chiapas, with the help of Gustavo Esteva in Oaxaca. Raymundo had invited us to visit with him the morning we arrived. The locale of San Cristobal de la Casas is in the centre of the state of Chiapas (a few hours west of Guatemala), nestled between green hills and mountains. Its small size (less than half the population of Oaxaca) was a refreshing greeting, especially after the re-circulated air on the crowded bus and the nausea that had permeated most of the waking hours in response to the continuous bends in the road. The air was chilly, a layer of fog covering many of the surrounding mountains. We went immediately to a hostel I had booked online to drop our luggage and go to explore the city for a couple of hours before making our way to CIDECI-Unitierra. The city of San Cristobal de la Casas is beautiful, colourful colonial-style buildings and centred around the main plaza, or Zocalo. 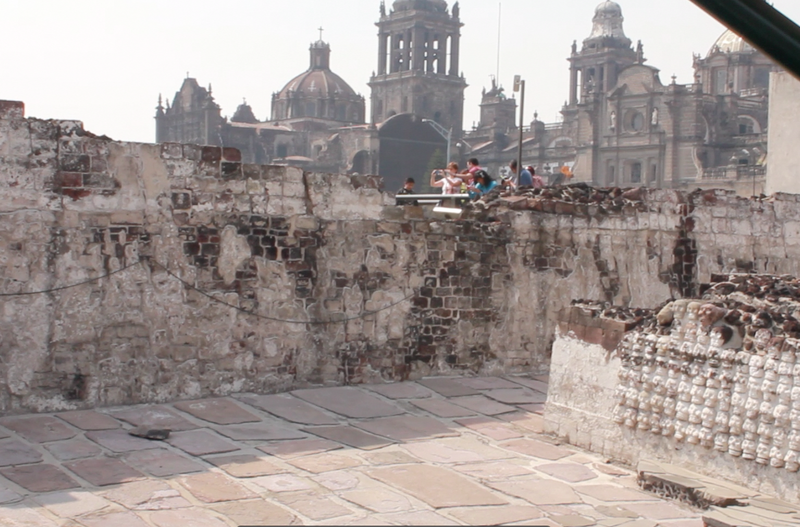 This was the Zocalo that the Zapatistas occupied on January 1st, 1994, when they let their presence be known to the world. 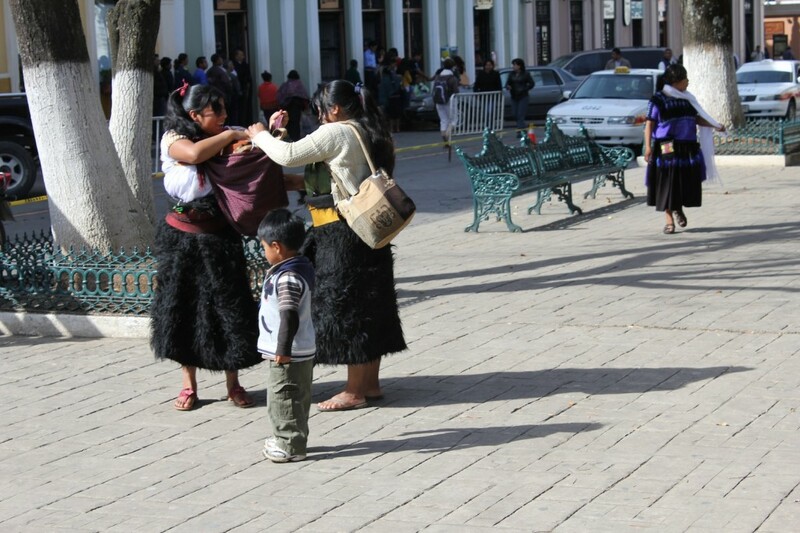 At 7.30am many people, particularly indigenous Tzotzil women wearing traditional goat-hair skirts, were carrying handmade items such as blankets, scarves and shirts and settling themselves in different corners of the square to sell their crafts. 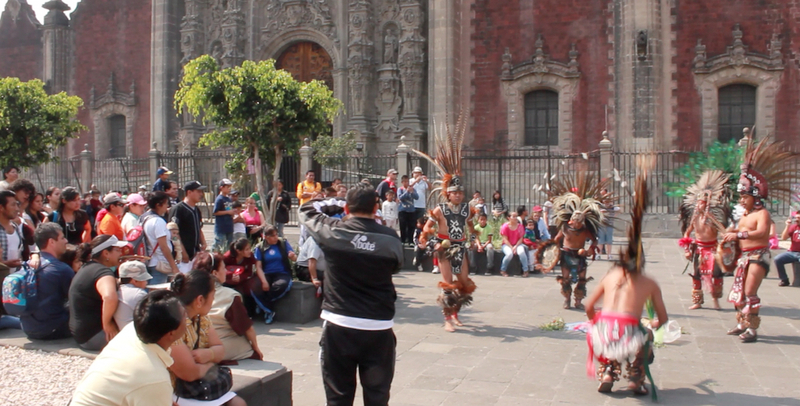 We located a restaurant that was open and serving breakfast which overlooked the zocalo. After an hour or so we hailed a taxi and gave the address that we had been given to us by Raymundo. The taxi wove its way through the city, past more outdoor markets, churches and streets lined with houses and shops about to open. We left the boundaries of the city and turned into a newer section within which the road became increasingly bumpy and only somewhat paved. At the edge of the housing, there was a steep hill on our right that was fenced in with rows of food being cultivated – maize, beans and squash (as part of a milpa) were immediately recognisable alongside other fruit trees and leaves of lettuce. Another couple of minutes and we came to an opening gate that painted bright colours of red, yellow and green. Udi spoke with a young boy who seemed to be helping through the gate and we were ushered through. 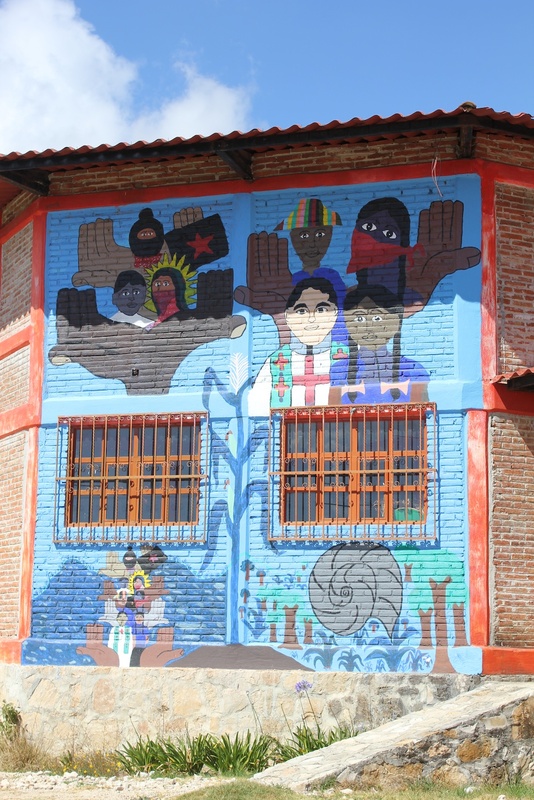 A colourful mural painted on the side of a building greeted us with a message – Resistancia y Autonomia CIDECI Unitierra (Resistance and Autonomy CIDECI Unitierra) – see photo at the top of the page. 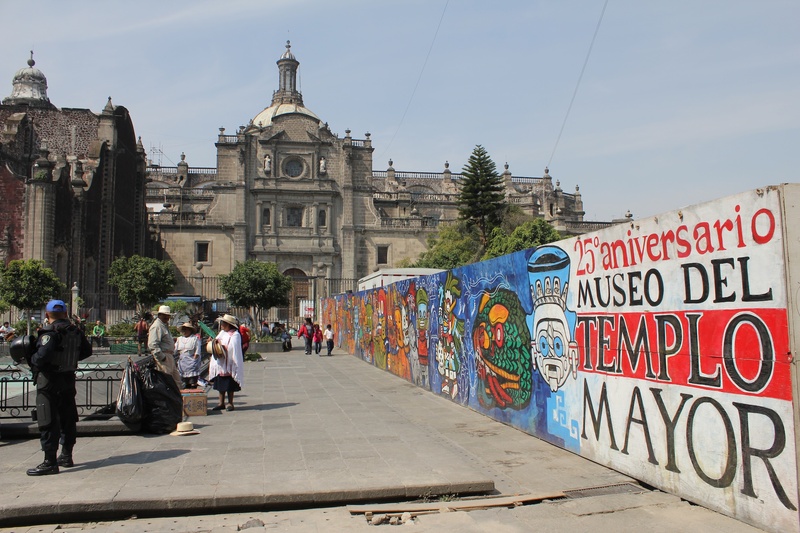 In front of us were many buildings, all painted in bright colours and many with murals decorating their sides. I was immediately quite curious and wanted to explore on my own, but decided it was more appropriate to wait until we met with Raymundo. After asking several people where we could find Raymundo, we walked on a small trail past several buildings, a small pond with ducks wandering about and into a forested area of evergreen trees. 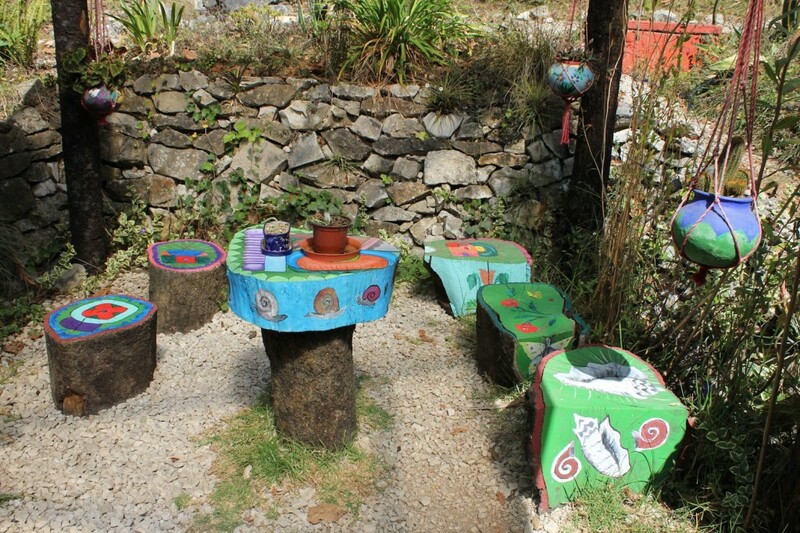 A house on the left had a round table outside with stools that looked like tree stumps. 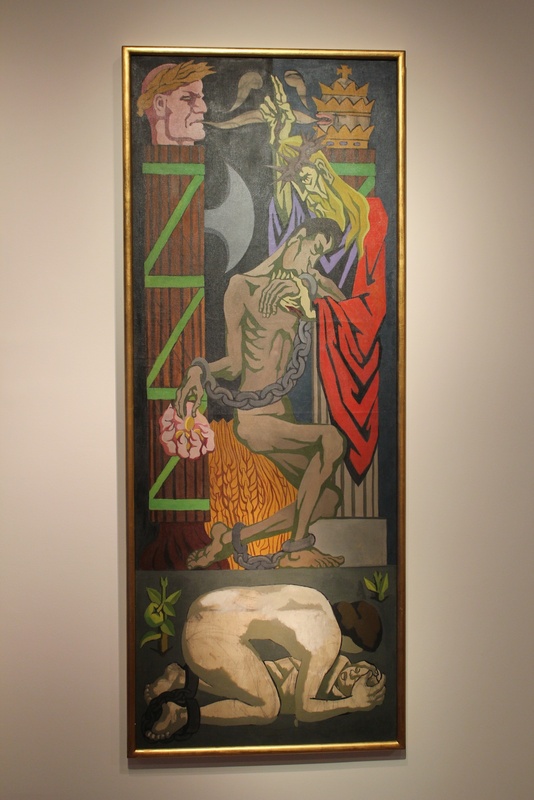 The entire scene was decorated with brightly coloured paintings of flowers, shells, snails… on the walls, the table, stools, fencing… We timidly entered the house calling for Raymundo who emerged a few minutes later and asked us to wait outside. Whilst waiting, I tried to take in the scene around me. The colours and designs, the gently swaying evergreen trees in the light breeze, were a feast for the senses and I had to hold myself back from immediately capturing it all on film. 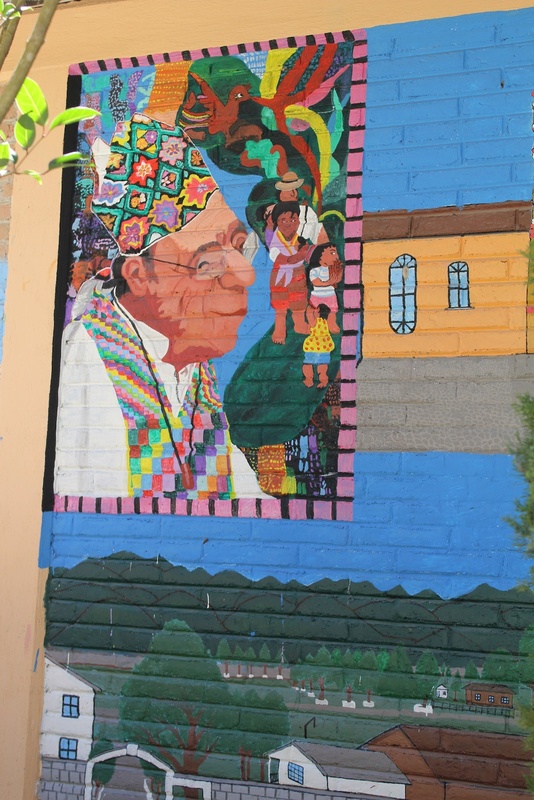 (Udi explained later…) Raymundo spoke about the trajectory of CIDECI, the influence of the local Bishop from Chiapas Samuel Ruiz and of liberation theology in the beginnings of a cultural and educational initiative with local communities back in the 1980s. He also narrated other influences in the development of CIDECI in its present form, Unitierra and Gustavo Esteva, ecologist and activist Vandana Shiva amongst many others (Ivan Illich, Immanuel Wallerstein, etc.). Later in our visit, as we were guided through the campus by a former student who now works there, we saw various rooms named after a number of these influences which have shaped the thinking and approach of CIDECI (see photos). 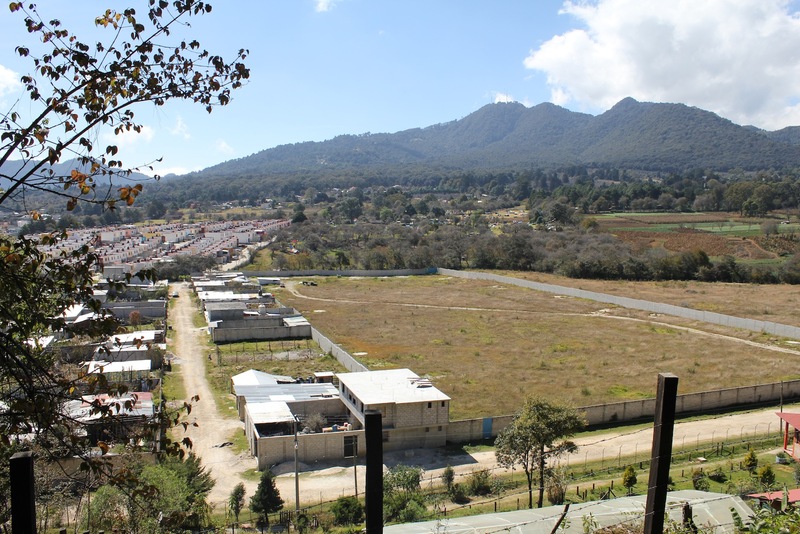 In its current form CIDECI occupies an area of approximately 20 hectares of land sloping up from a developing neighborhood at the edge of the city of San Cristobal. With our guide we walked through a number of large and amazingly resourced rooms: mechanics, sewing, architecture or shoemaking workshops, printing or weaving workshops, a music building with rooms divided according to types of instruments, a beautiful library and seminar rooms build out of adobe and decorated with paintings and plants and murals, everywhere murals. We also saw a large seminar room that could accommodate several hundred people and a chapel were students attend a daily service. 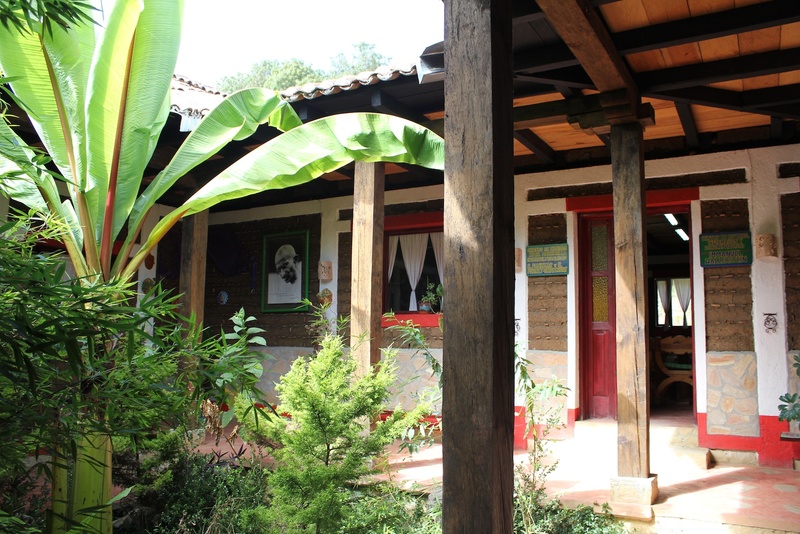 We also visited the bakery, the farm where chickens and rabbits where raised kept and the milpa which made the whole learning community almost self-sufficient. 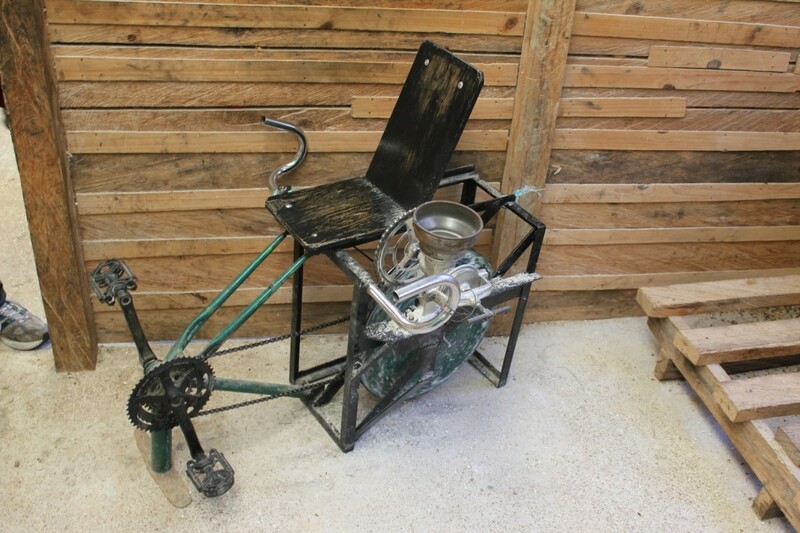 We noticed in particular a version of a bicycle used to grind corn as it is pedaled. 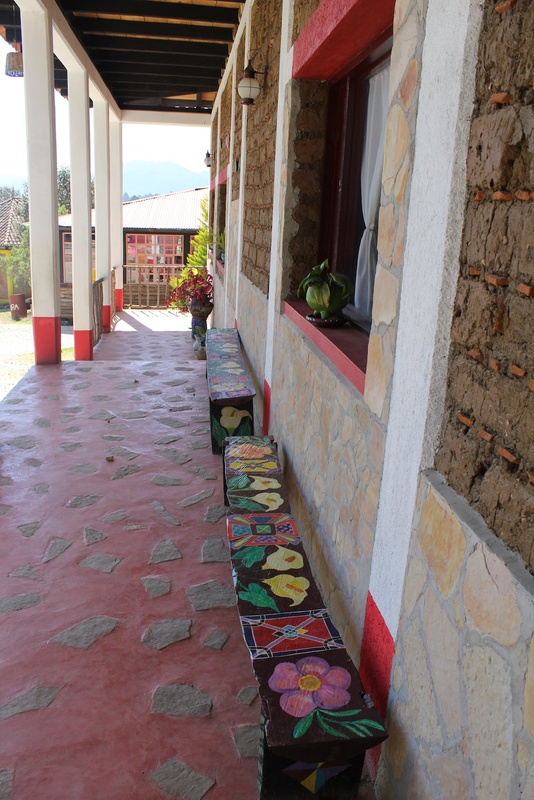 The students come from indigenous communities throughout Chiapas, many of these communities caracoles controlled by the Zapatistas and many with first languages other than Spanish. They come here to stay for a few months or several years before going back to their villages and taking the responsibility to teach or practice the learning they experience here and the skills they acquire. 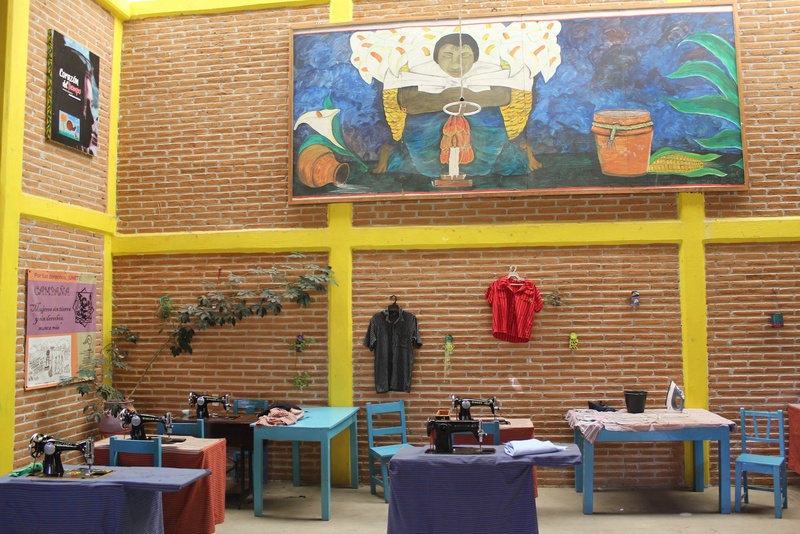 Many ex-students have taken the role of teachers on the various courses they offer which range from the various technical skills mentioned above (mechanics, weaving, shoe-making, electronics, carpentry, hairdressing) to courses around health and nutrition, to those around cultivating food (within a milpa) or raising animals. Alongside these subjects there are also regular weekly and monthly seminars which also bring together others from outside CIDECI. We were invited by Raymundo to join one of these seminars on Saturday discussing the work of John Holloway, an Irish academic who left the academic scene in the UK and moved to Mexico where his work How to Change the World Without Taking Power has become influential amongst activists, here and elsewhere. The seminar was attended by a diverse group of about 25 or so local academics, students, activists and NGO workers. The seminar meets regularly and many here already knew each other and were familiar with each others’ perspectives. The book for discussion was Holloway’s Agrietar el Capitalismo, el hacer contra el trabajo (Crack Capitalism, Reflections on a Revolution). During the seminar, we sat in the Immanuel Wallerstein room around a large decorately carved (and painted) wooden table. After a couple of hours, there was a break and everyone went outside to share coffee and baked goods (from the bakery on site) along with at least 30 or so students, many of which were indigenous women. 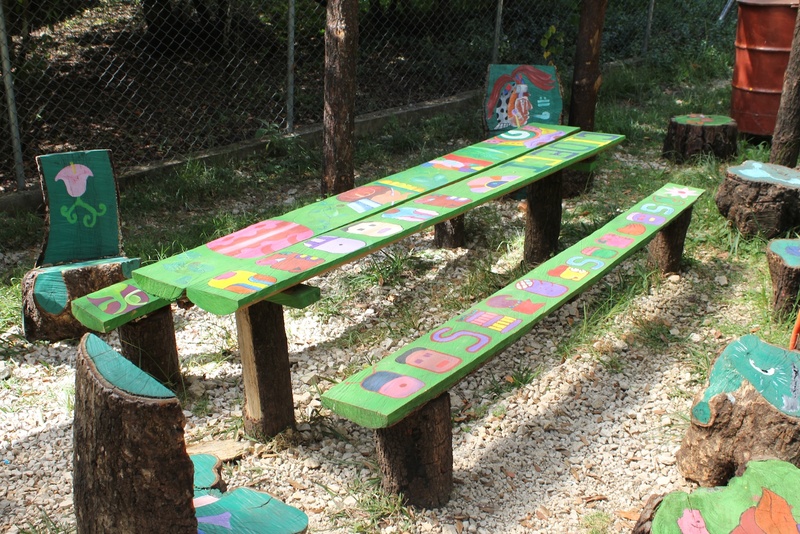 There were children also playing which made the atmosphere that much more relaxed and warm. 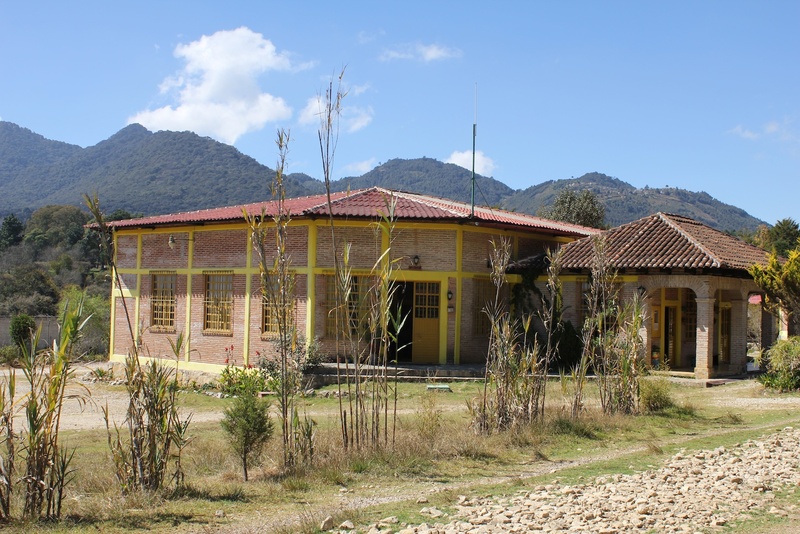 Some days later when we visited Oventic, the Zapatista village some hours drive from San Cristobal, we were told by a friendly shop-owner that most of the young people from the area went to CIDECI-Unitierra after they graduated from the local Zapatista-run secondary school. Here, as in CIDECI, those who teach there are not paid professional teachers but are people from the communities who want to share their learning with others and, in the case of CIDECI, receive a small sum for travel and keep. We wished that we had had more time to spend at CIDECI, getting to know the people learning, living and/or working there. 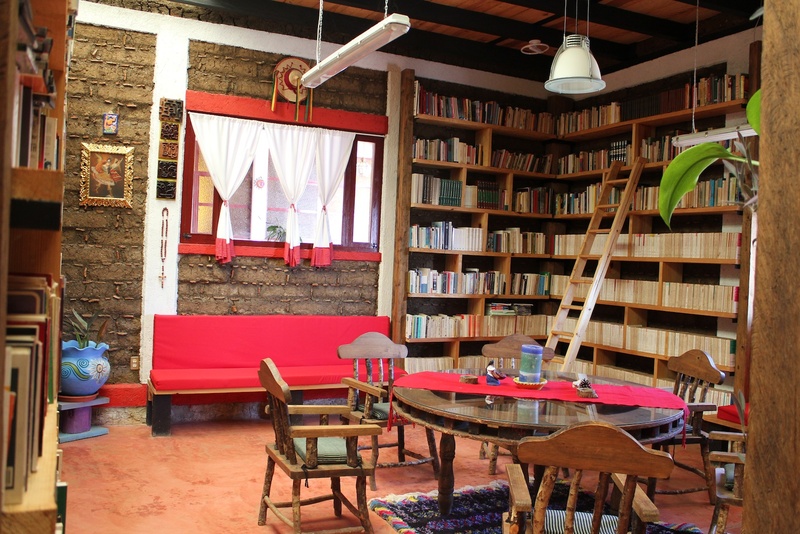 We found the place a beautiful and creative space to in which to learn and live in a community that is, like Unitierra in Oaxaca, engaging deeply with issues of self-sufficiency, autonomy, ecology and sustainability. 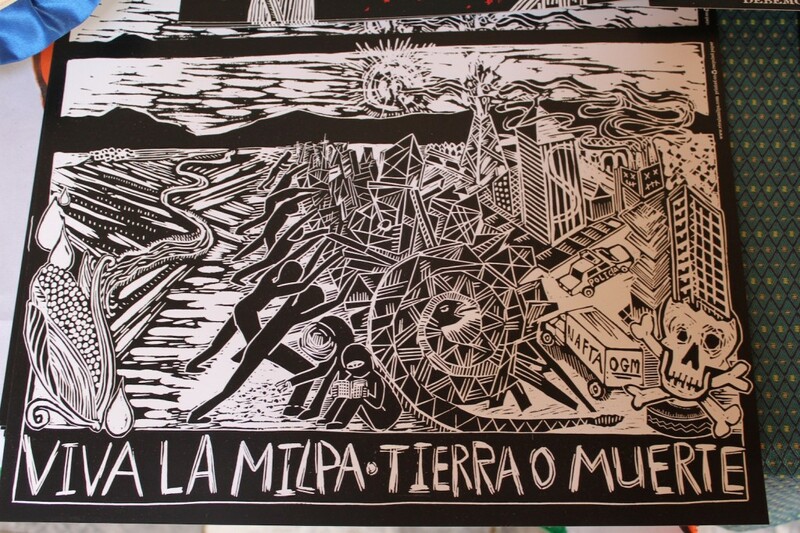 What are these different worlds that the Zapatistas are referring to? How is their world coming back – and how is our world collapsing? 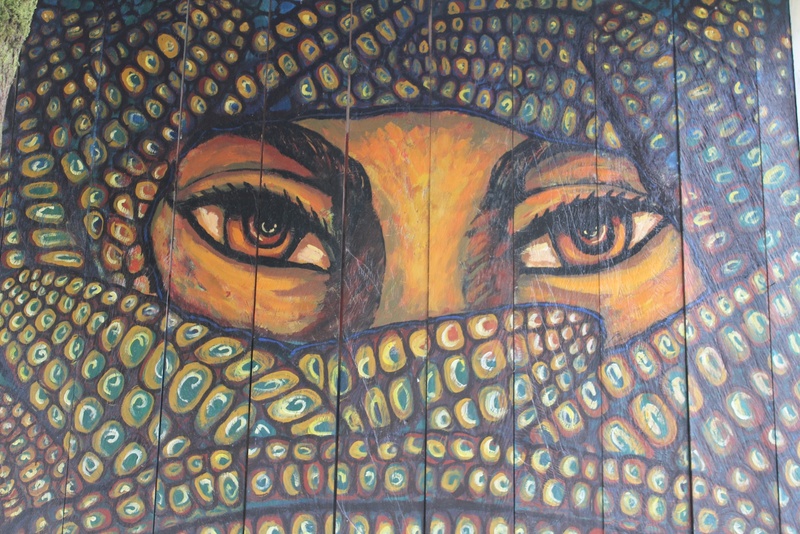 What place does Zapatismo have in the world today – how can we understand it, learn from it and apply it into our own lives? These were the exact questions being asked in the Zapatismo seminar we attended on our first day visiting Unitierra. 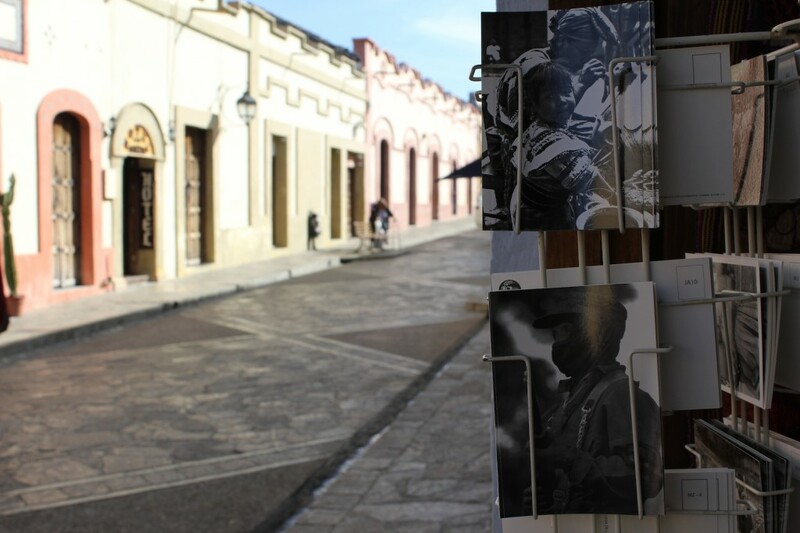 This particular week’s seminar that had been advertised across Oaxaca, through email, Unitierra’s blog and through flyer, was focusing on the 19th anniversary of the Zapatista uprising, critically engaging with the question of, What does Zapatismo mean today? 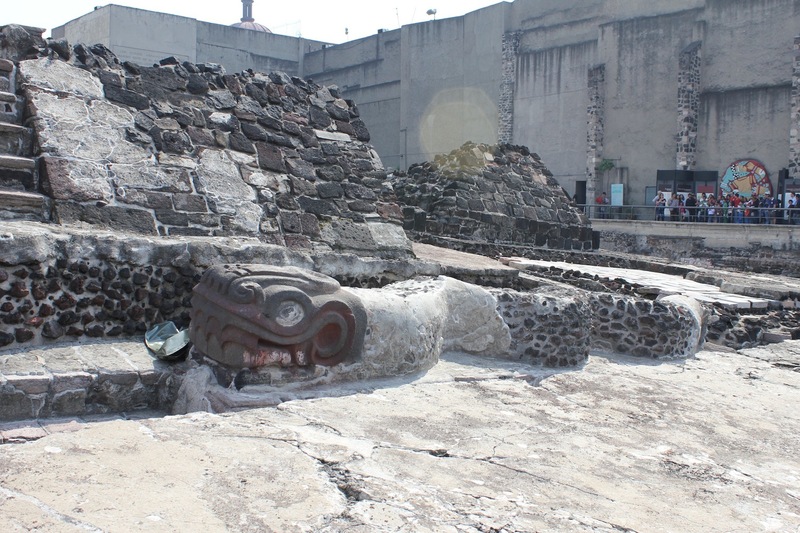 The answer to this question emerged over two and a half hours of critical discussion, debate and emotional statements – different historical narratives – coming from more than 40 people in the main room at Unitierra – Oaxacans – Mixtecs, Zapotecs, Mestizos… Europeans, Americans – from the age of 18 to nearly 80. I was lucky enough to have simultaneous translations provided for me by a friend. At the beginning of the Unitierra seminar, Gustavo helped to provide a stronger background of the Zapatistas. 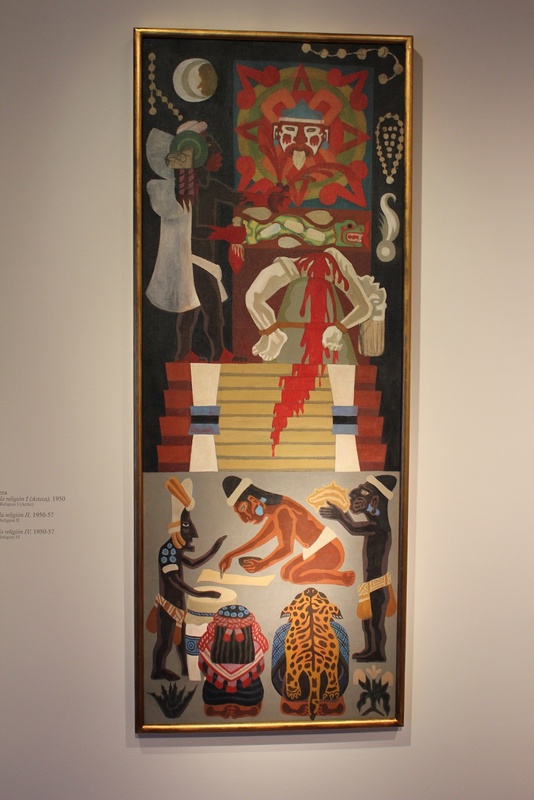 The three people (2 men and a woman) who initially went to the Lacandon jungle (in northeast Chiapas) as guerilla activists in 1983 to begin organizing an indigenous uprising were not indigenous themselves. They had each been politically active during the 1960s and the 1970s and had endured varying degrees of violence (torture and incarceration) at the hands of the state. Clearly these years of violence did not encourage them to discontinue their involvement. Rather, it stirred an even deeper commitment. 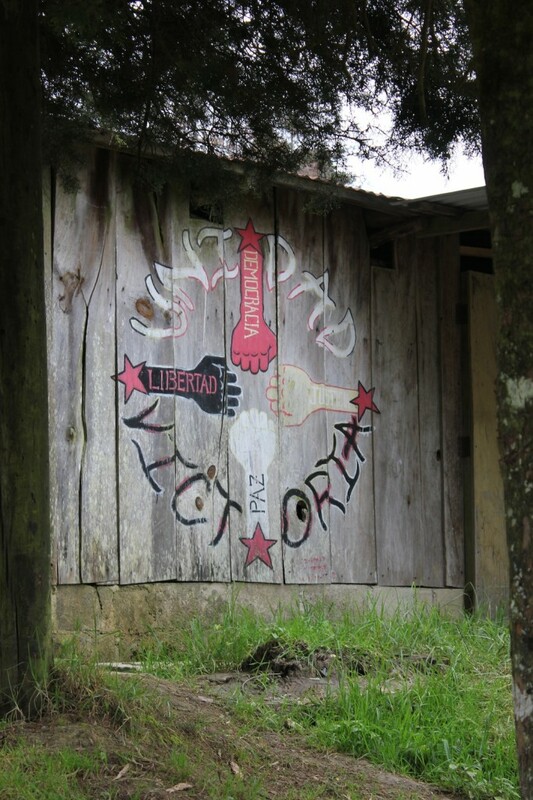 Living in the Lacandon jungle – especially as a shift from living in an urban center, is no easy task. For more than 10 years, these three people slowly mobilized – without any knowledge to the outside world – thousands of indigenous peoples from different Mayan communities, within Chiapas. Gustavo told us that aside from learning about survival in the jungle, the biggest learning for these non-indigenous activists was about listening and communication. 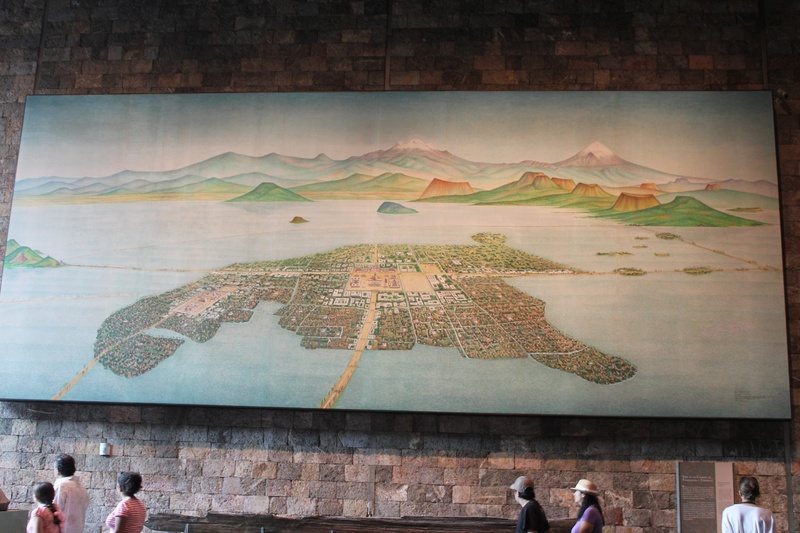 When they initially came to discuss current problems – and histories of oppression – with local indigenous Mayan peoples in villages, they were not understood. They were still talking forcefully through their ideals as guerilla activists. They had to become more humble, bring their thinking ‘down to Earth’ – and instead, to listen. This required a complete shift in learning – toward dialogue (that prioritizes listening) and forms of encounter and assembly. 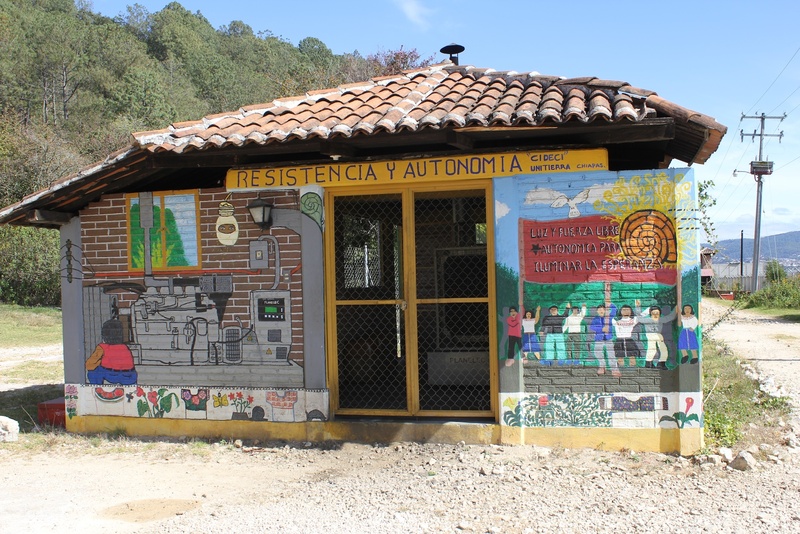 These two notions – encounter and assembly – are still the two key principles for the Zapatistas. The third is to create. Encounter. Assembly. Create. To encounter, is to engage with the other, through an ethic of opening up oneself even, or especially at the risk of losing yourself. It is to listen (radically). As they see it, encounters cannot be exhausted – listening should never stop. Assemblies are created through collective decision-making bodies through a perception and practice of power that is atypical to what is normally practiced in politics (our current forms of democracy). 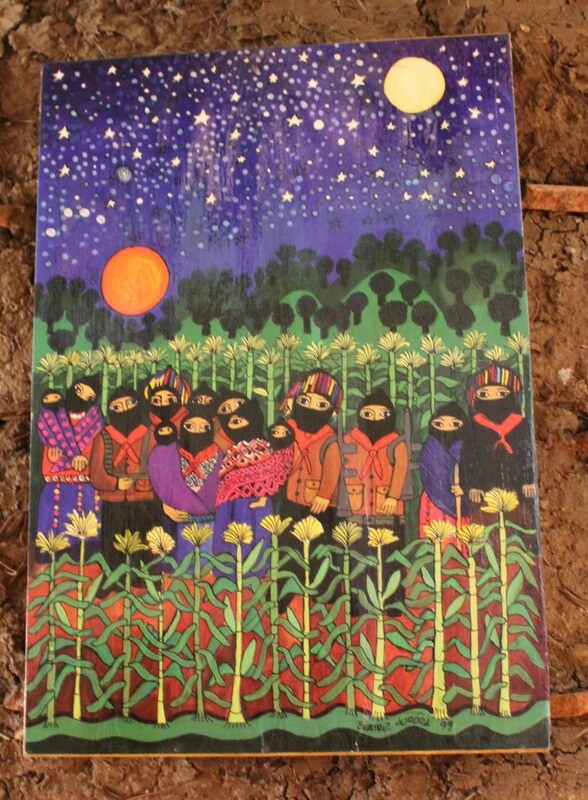 The Zapatistas are re-creating (and re-claiming) indigenous forms of leadership that have otherwise been lost over the past several hundred years. These assemblies are not about taking power, rather they are about sharing it. It is about learning how each one of us can exercise power in ways that does not support the current ‘Empire of Money’ – but rather learning how to create other worlds outside. 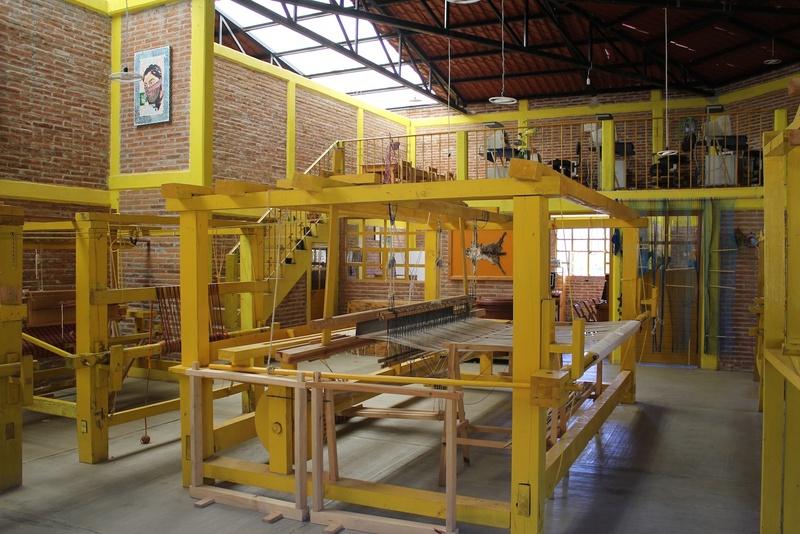 This is where create comes into the picture – creating autonomous forms of education, health, justice, government, food cultivation that is through shared decision-making. 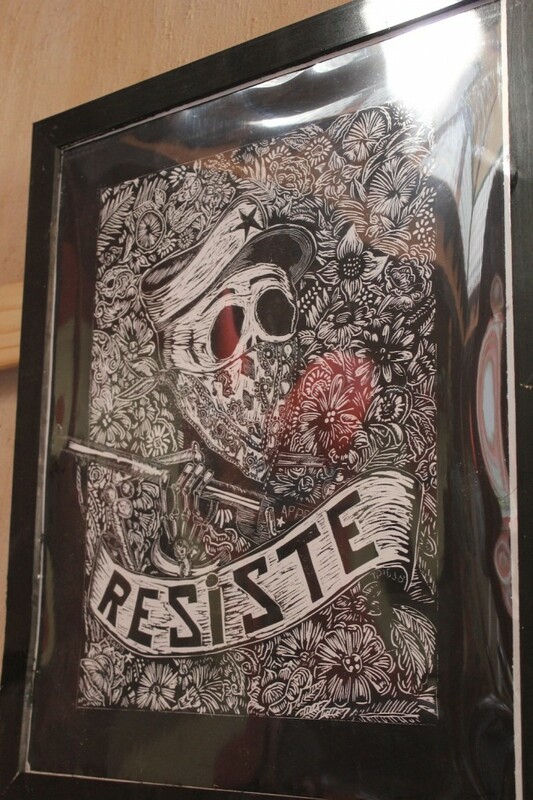 It is currently through the formation of caracoles (slow moving snails) that governing occurs within Zapatista communities (see Udi’s post on art of rebellion – part 2). 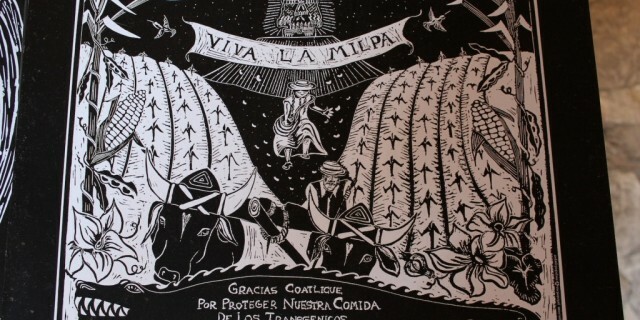 There is much to consider from what the Zapatistas are advocating. One of their main challenges is for us to change our perceptions of power. The Zapatistas tell us that we need to equip ourselves with ‘inverted periscopes’. This means that instead of trying to understand what is going on ‘above’ in the ‘halls of power’ we should be looking way down below, on the ground, in the spaces that tend to be ignored. Power is not only with those ‘up there’ – those ‘in power’ – power that is exercised over people. Another way of understanding this is that there is power everywhere, we all can exercise power in multiple ways –through people and with people – also with the Earth, alongside non-human species. It is entirely possible to exercise power without taking it. We may not believe it is so, but this is exactly what the Zapatistas are trying to do. 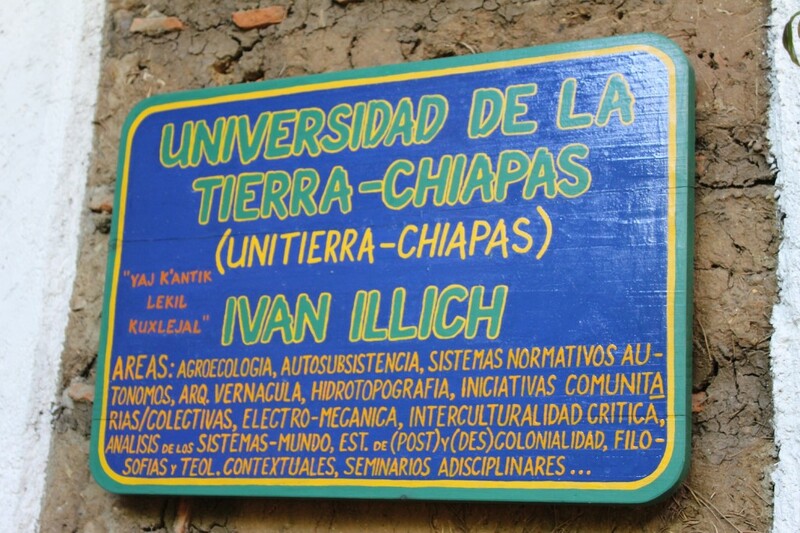 The shift in learning – towards listening and toward ‘becoming common’ – that occurred between 1983 and 1994, helped to organize thousands of people – Tzotzils, Tzeltals, Tojolabals, Chols, Mams and Zoques – all united for the first time in insurrection as Zapatistas. 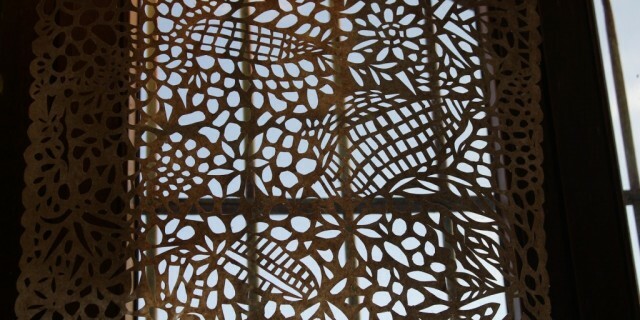 To become united they learned new ways of communication and more critical understandings of historical experiences. They also learned how to arm themselves and how to stand up for themselves following over 500 years of oppression at the hands of (primarily) the Spanish, the Church, the Mexican government and now, multi-national corporations. The learning continues… from letting go of arms (fire) that were used more strongly in the early days and instead building dialogue through encounters that prioritize communication (the word). The decision by the Zapatistas, the EZLN, to surprise the world and occupy buildings across Chiapas on the 1st of January, 1994 was no accident. It was a war that begun out of desperation (and it was through the use of arms that the primary source of controversy is centered). 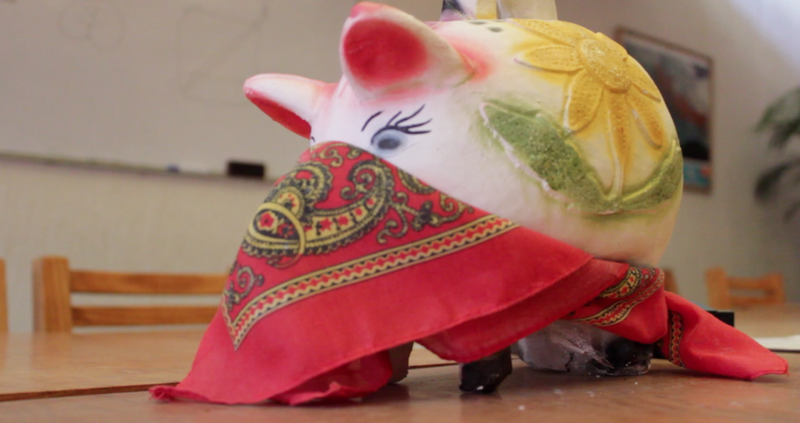 The Zapatista emergence into public visibility was carefully calculated. It was the same day that NAFTA was signed. 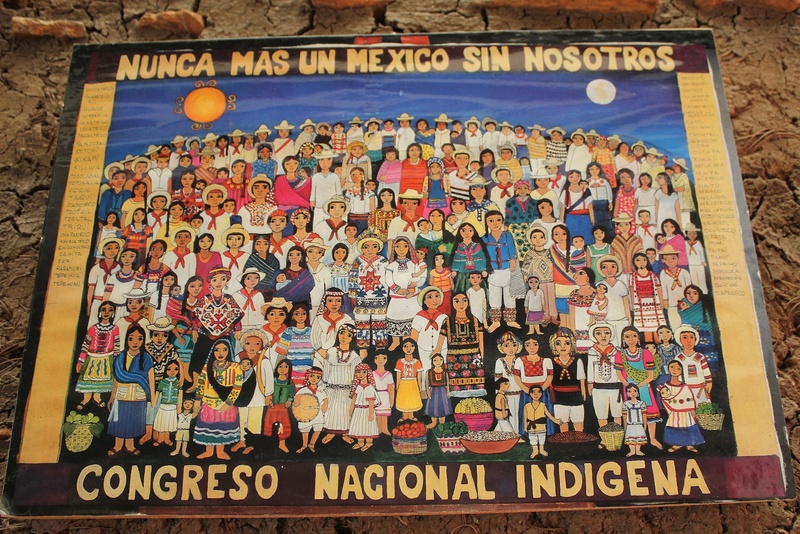 The Zapatistas knew well that such a law would affect themselves – as indigenous peoples – more than anyone else (see my previous post on Maize and Milpa for more discussion on NAFTA). Their initial demands of housing, land, work, health, education, food freedom, independence, justice, democracy and peace have essentially turned into demands for autonomy, for self-sufficiency through which they are able to provide these demands for themselves. They continually have to struggle for the recognition of these demands. 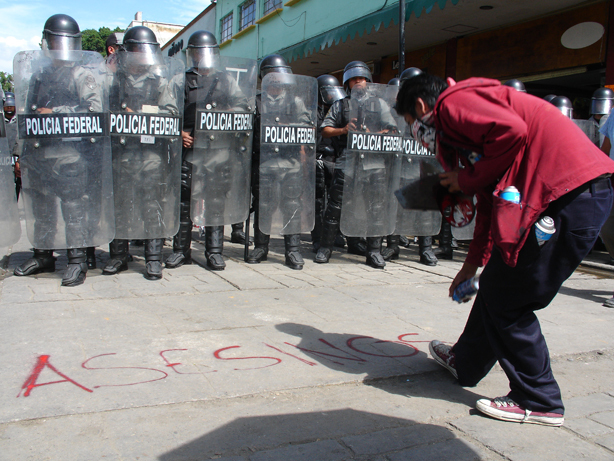 There is a long history of struggle and reactions between the Zapatistas and the Mexican Army and government that continues today. My first encounter with the Zapatistas – virtually – was in Pakistan when I became acquainted with Assim Sajjad Akhtar who was then dividing his time between leading the Peoples Rights Movement (PRM) in their support for landless peasants in Pakistan, teaching (post)colonial history at the Lahore University of Management Sciences (LUMS) and writing as a journalist for Pakistani media – The Nation, Dawn, etc. (Aasim is now a professor at Qaid-e-Azam University in Islamabad and continues to publish as a journalist and assist PRM). In Pakistan, through Aasim’s knowledge, I learned about the Zapatista’s existence, what they were trying to do and how they were trying to do it (and how it related to what PRM was doing in Pakistan). My learning was expanded further when I returned to London, participating in the European Social Forum (the regional World Social Forum event) in 2004, where there was an abundance of literature available about the Zapatistas and people speaking about them – people who had spent time with them in Chiapas and other parts of Mexico. 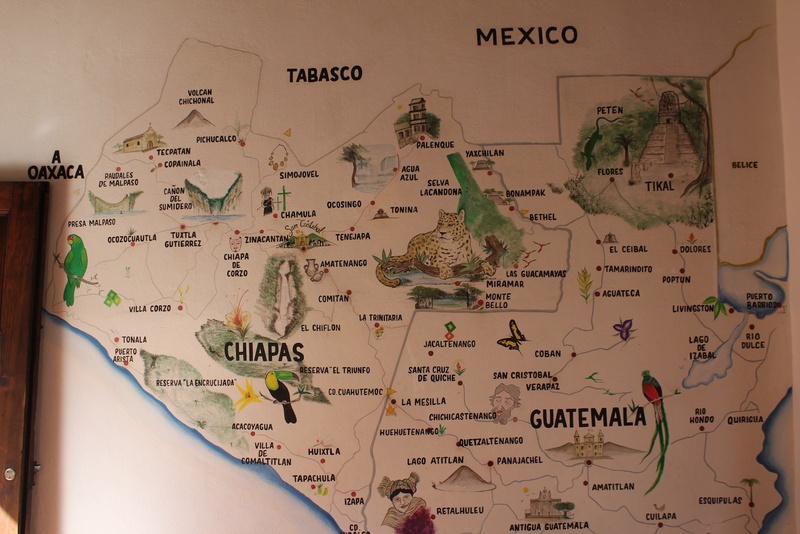 Although the work and struggle of the Zapatistas is located in Chiapas, they have been hugely successful in assembling international solidarity – inspiring imaginations, creating new visions and igniting controversy and debate through an intensity of dialogue that has emerged in various forms and in various places. Between the WSF London and this trip to Mexico, I had been incorporating the Zapatistas into my teaching at the University of Bath – particularly in two units: Researching Social Change and Education and International Development. 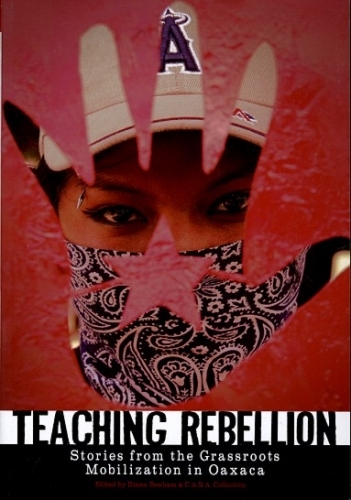 The insights about the Zapatista orientation and cosmovision as associated to social movements (what they are and can be) and the learning that goes on in them (expectedly and unexpectedly) are immensely engaging and controversial which adds more flavor to critical discussion and learning. To help me incorporate the example of the Zapatista movement into my teaching, I used a particularly inspiring book that I had encountered in 2009, The Fire and the Word: A History of the Zapatistas (by Gloria Rumoz Martinez – 2008) at the Solidarity Economy conference in Hampshire, Massachusetts. 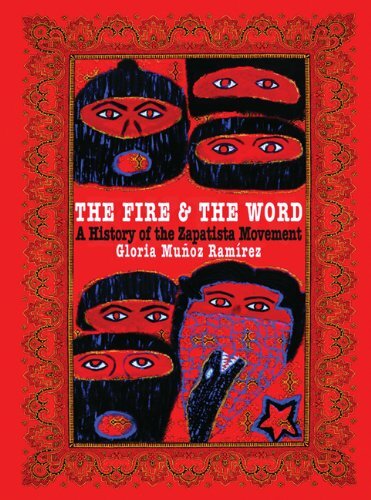 From the social research perspective, what I find most interesting about the book The Fire and the Word is the way that Gloria presents the ‘histories’ of the Zapatistas – as a series of narratives and images. She prioritizes photography, sketches, diary entries, interviews and her own analyses. 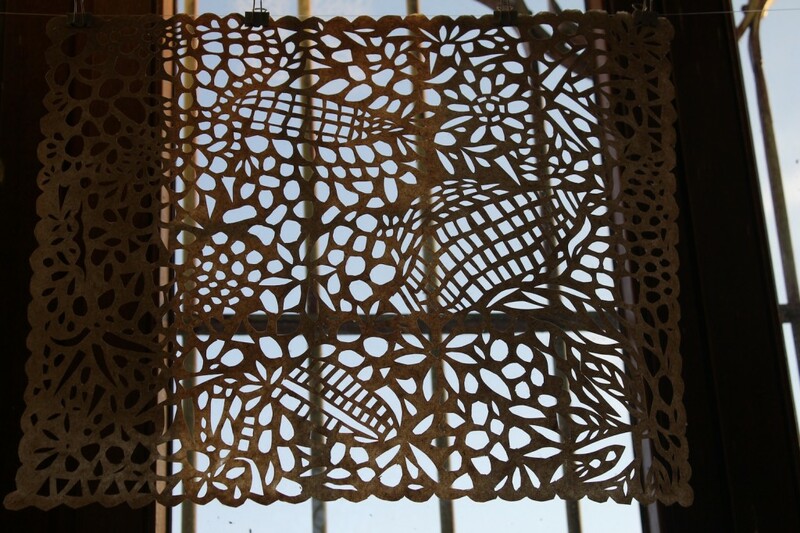 These are all woven through the book equally – all modes of representation predominate. I have always hoped that encountering such a diversity of representations helps to create further debates about the politics of representation – in research – and also what counts as research in the first place. And, what stories are the ones that matter? How can historical experience be represented? 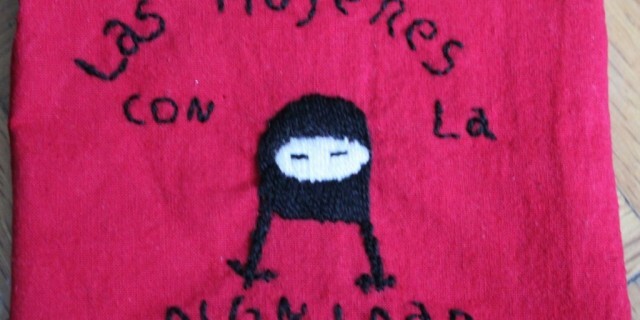 My learning about the Zapatistas since 2004 has been in stops and starts, fragmented and intermittent. The time we have just spent in Mexico enabled a tremendous surge of learning more about the Zapatistas through many events and encounters – the Unitierra Zapatismo seminar, reading more literature (from the shelves of Unitierra) and visiting Chiapas – watching historical documentaries about the Zapatistas (at the cultural centre such Cronica de una Rebelion and A Place Called Chiapas) and visiting Oventic, one of the Zapatista communities – or caracoles (which they are called – see Udi’s posting on Art of Rebellion 2). There is more I could say (much of which engages with the controversies of the Zapatistas not explored in this post) and a substantial amount that has been written, documented and debated about the Zapatistas. One particular insight I learned from the Zapatistas stands out for me. This insight is the statement by the Zapatistas that there is currently a total war occurring – in every corner of the world. The Zapatistas call this total war the ‘Fourth World War: The Empire of Money” that is against all of humanity and the Earth (the idea of 4th as following from WWI, WWII and then the Cold War as WWIII). This “Empire of Money” prioritizes extracting and pursuing profit at the expense of everything and anything blocking it. 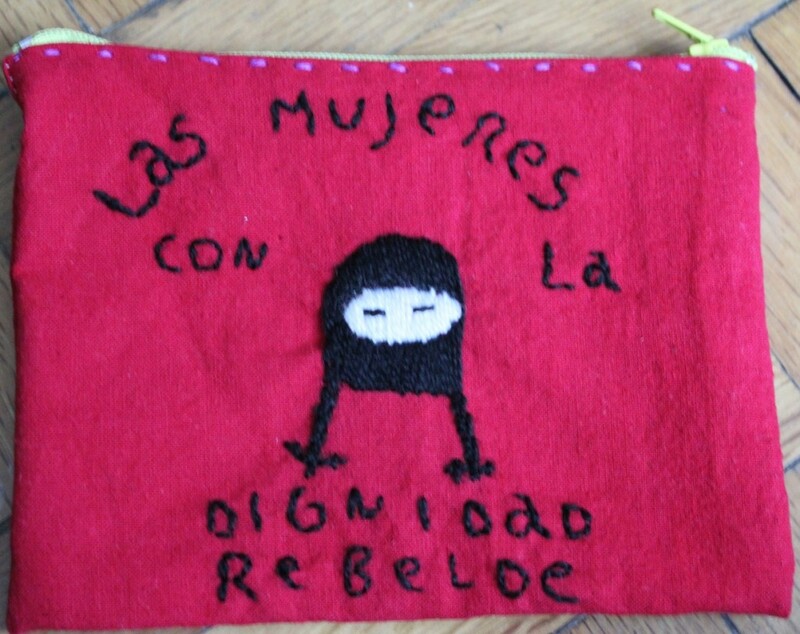 In the Zapatista perspective, this is a war of no fronts – there is no nation against nation, group of nations against another group of nations… it is about imposing an ideology across the entire world – of profit and capital, into every corner of the world. The enemy is everyone – any person or group can be, or is considered an enemy any time that the ‘Empire of Money’ is threatened (the recent media and state resistance to the ‘Occupy Movement’ comes to mind). 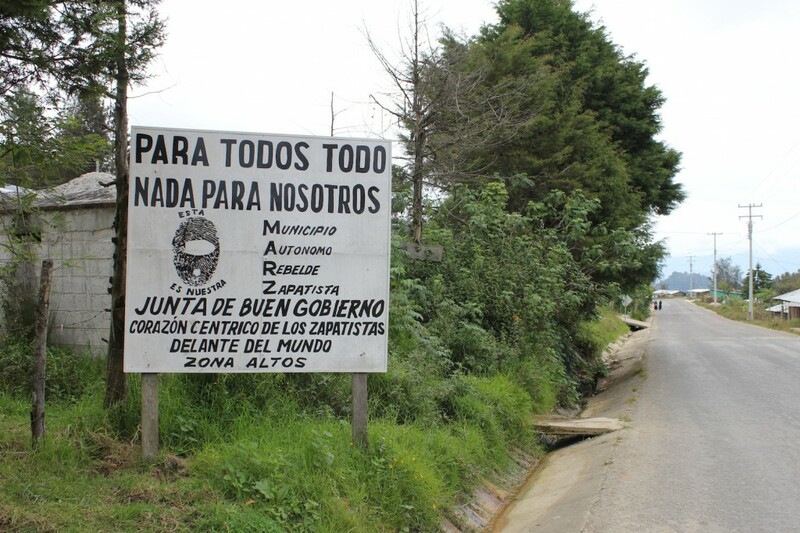 The Zapatistas explain that within this current war, states (government) are being reduced to puppets of privatization and the multi-national corporate world. Armies are fighting to uphold the strength and spread of this empire – rather than protecting their own nations within their own boundaries. Through globalized forms of exploitation and extortion of profit the ‘Empire of Money’ seeks to capture and control all territory (land) and labour to expand and construct new markets. 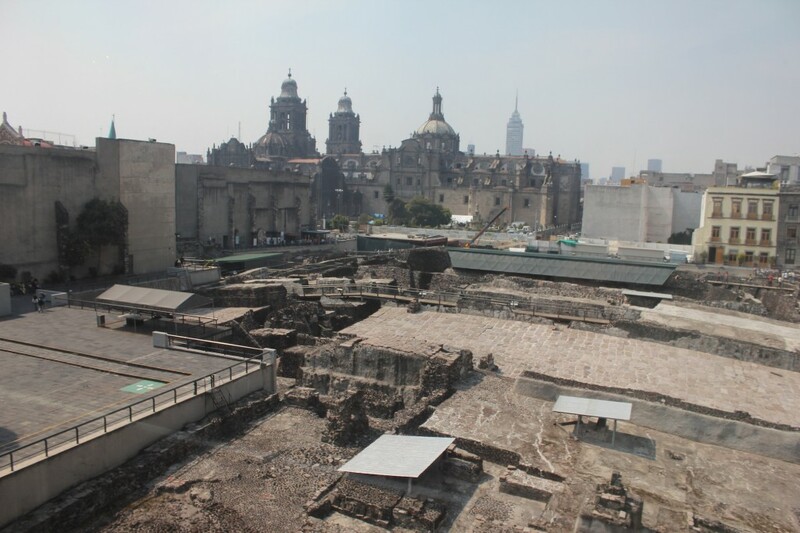 The ‘Empire of Money’ seeks to destroy any way of life that defies this orientation and organization – anything that allows individuals and communities to exist outside of capital must be destroyed or reduced to a quantifiable exchangeability – cultures, languages, histories, memories, ideas, dreams… The new world/s the Zapatistas are creating threaten the Empire of Money. It is through non-capitalistic (non-profit orientated or non-quantifiable) forms of self-sufficiency, autonomy, hospitality and comunalidad – that is practiced, promoted and studied at Unitierra that this ‘Empire of Money’ is also directly challenged. Many of the young people in the Unitierra seminar room had spoken of their involvement in social and political change – profound frustration with the present challenges and a lack of coherent vision for the future. I remember how several spoke of their lack of knowledge and understanding of political activities prior to the Zapatistas, how wonderful it was for people like Gustavo who were older and had such a rich history of experiences and knowledge. Several also spoke of the importance of ‘searching for light’ — ‘looking for examples that inspire us to invoke the world through thinking of it, imagining it. It is also about acting out of love, hospitality and friendship’. 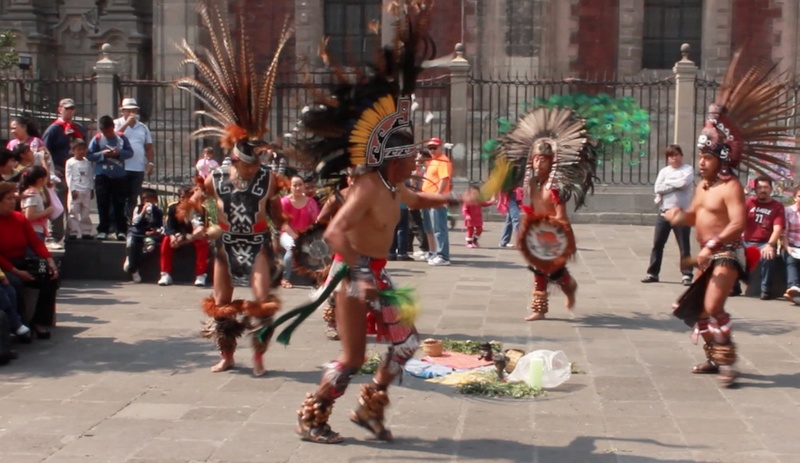 I remember something very wise that Edgar (Edi) the young Zapotec learner at Uniterra we had met first earlier that day, said during the Zapatismo seminar. He said that Zapatismo is about looking into the mirror at ourselves, seeing our own path, our own choices. It is about looking at the responsibilities that we face and that we choose each and every day. I left the seminar, my head and my heart full – yet also hungry for more of these encounters, these assemblies, to inspire my imagination to create…. As we began to explore in the recent post on autonomy, the cultivation of food as a source and practice of autonomy is core to Unitierra. There are food-orientated workshops at least twice per week, sometimes 3 or 4 times per week, either on the roof of Unitierra, using their urban roof garden area, or within a range of different pueblos (villages – primarily indigenous) or suburb areas that tend to be characterized by material poverty and families that have emigrated from different part of Oaxaca state and Mexico. 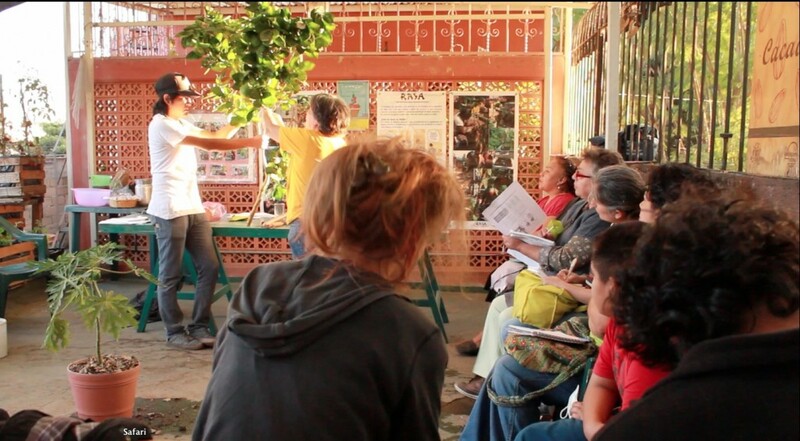 We attended (and filmed) one of the workshops that happened to be on tree grafting. There were 13 people in attendance – men, women, young and old. The workshop was informal and very engaging with demonstrations and different people helping to plant and manipulate the papaya tree to be grafted and propagated to form new roots and another tree. At the end of the workshop, juice and cake were passed around that one of the learners had prepared. 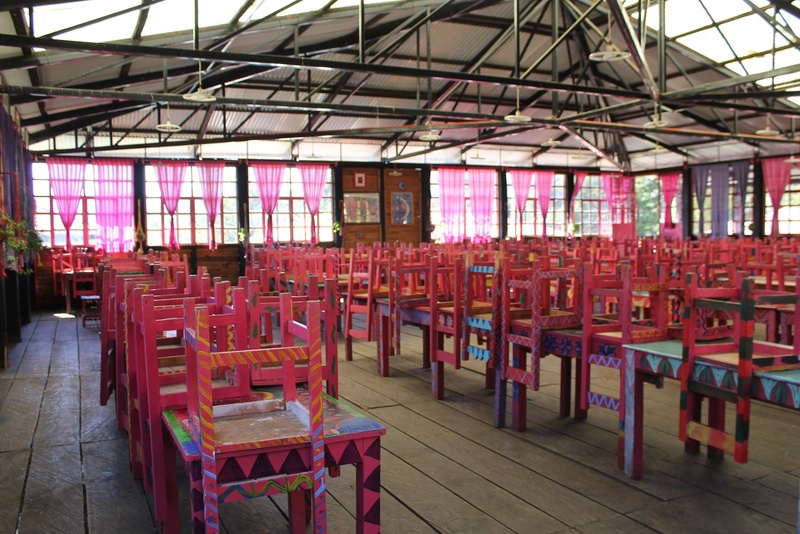 This aspect of learning – cooking and eating together (sometimes through the form of community fiesta) is integral to all learning situations at Unitierra. The purpose is to enjoy the process of learning together, to build hospitable relationships and to build a strength around the cultural importance of foods – particularly those grown on milpa. Maize is to Mexico (to all Meso-American civilizations actually), what buffalo are to the Blackfoot (see previous post, ‘The Land, the Blackfoot and the Buffalo’). 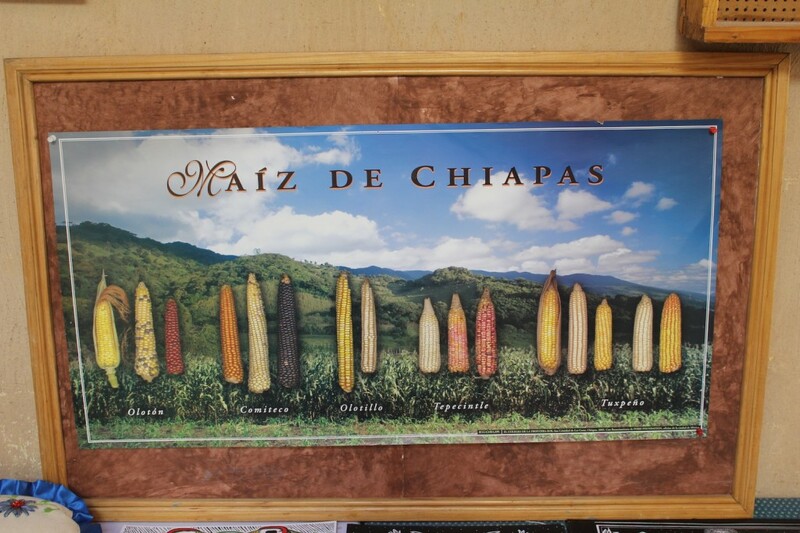 In Mexico alone there are over 60 breeds of maize and thousands of local varieties – white, yellow, red, blue, purple, black… Mexico is home to the most diverse range of maize seeds and varieties in the world. 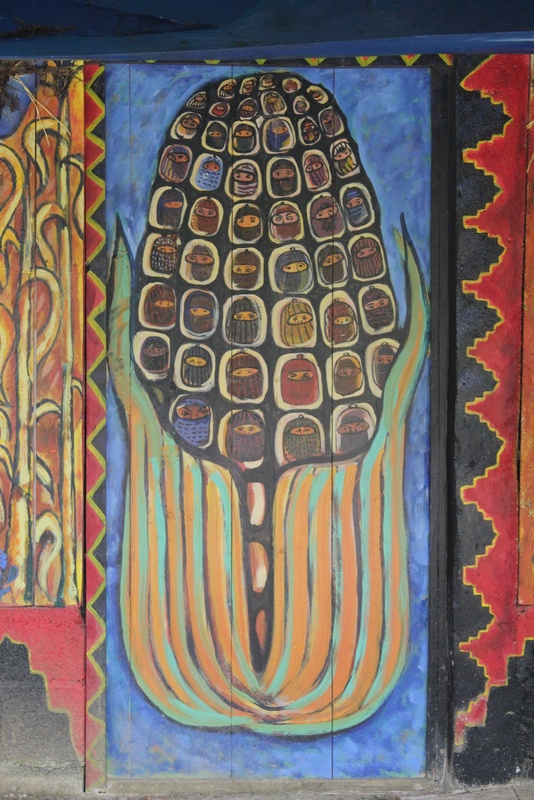 Maize, as a core food grown within the milpa, is central to all Meso-American cultural cosmovisions. 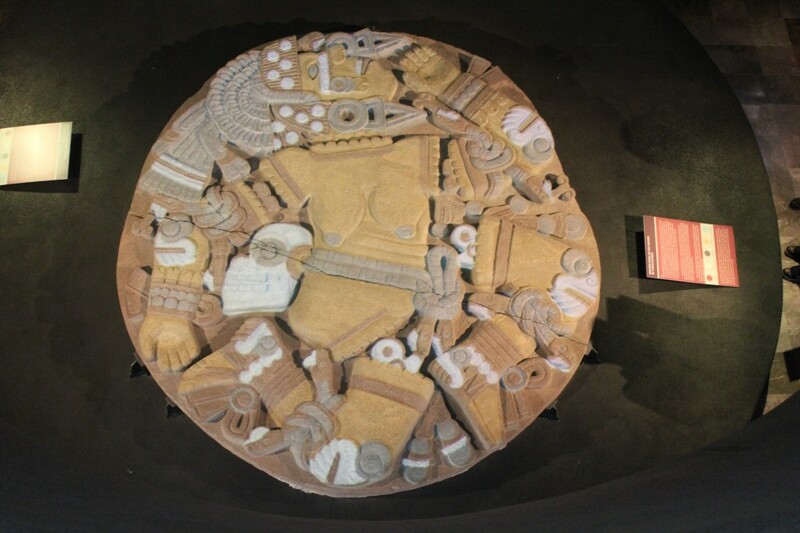 The domestication of maize began anywhere between 5,000 – 7,500 years ago, the oldest archaeological remains were discovered in Oaxaca. What is significant about this is that maize can only grow with human intervention as the corncob can only spread its seeds with the help of humans. 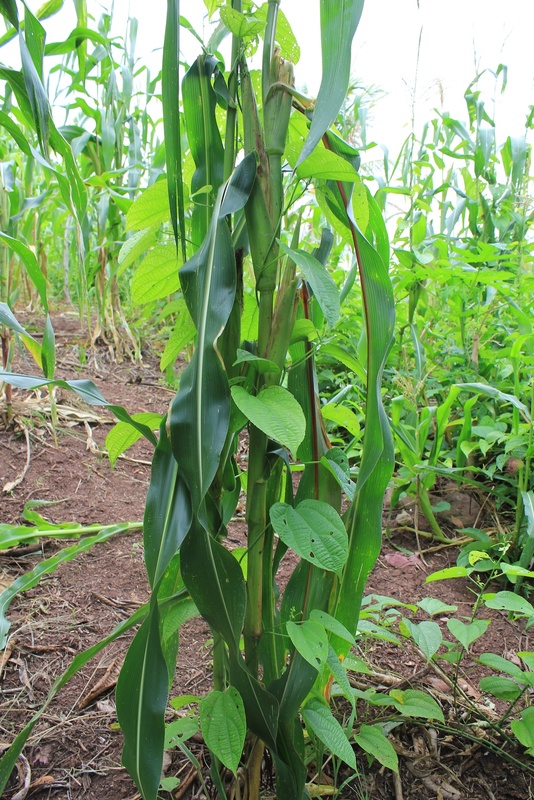 Maize grows best when it is accompanied with beans, squash, chilies, tomatillos, avocadoes, gourds (in many circles this is known as the ‘three sisters’ – corn, beans and squash) – in a small and manageable area that is nourished by its use during two continuous years (followed by 8 years lying fallow). The nourishment of these cultivated areas can be understood as a milpa. In Spanish translation, milpa essentially means ‘field’ (in English). The term milpa comes from Nahuatl (the widespread Aztec-based language that tied hundreds of indigenous communities together through some form of a common language) which originally meant ‘to the field’ – the term ‘mil’ meaning ‘field’ and ‘pa’ meaning ‘going to’. This difference, though subtle, is profound. ‘Field’ is a noun, a thing, an object. ‘To the field’ denotes action, a verb, an intention. 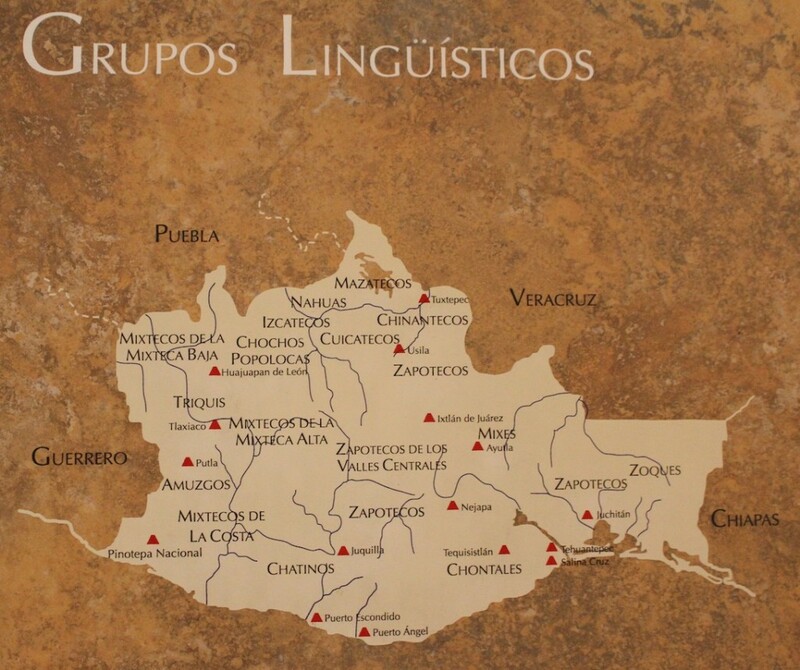 As we wrote in previous postings on Blackfoot knowledges at Red Crow Community College, many indigenous languages are primarily verb-based (rather than noun-based as typical to English and Spanish languages). The actions ‘to the field’ were based on spiritual and physical nourishment, not only to each human being, but to the broader community, the soil, the local plants and animals and the entire Universe. 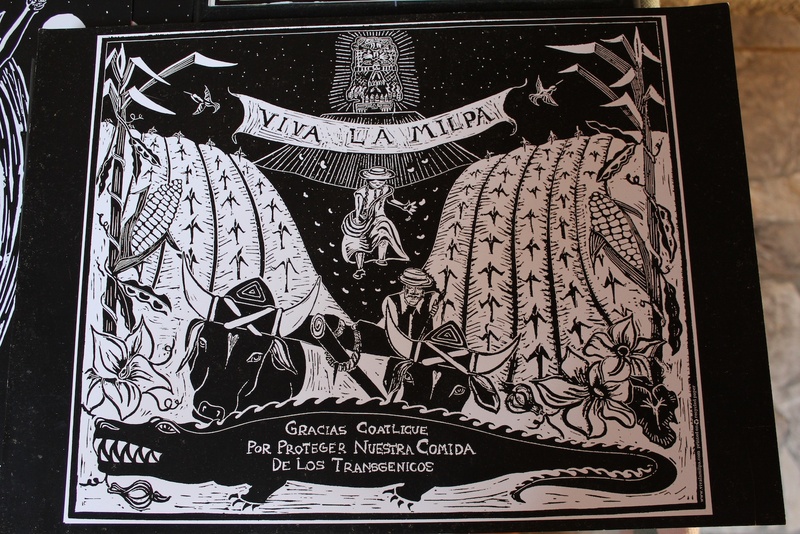 A milpa is designed as a miniature version of the entire cosmos, the universe. Hence, ‘to the field’ indicates intention that is not just to the growing of a crop, but to the tending and nurturing of the entire cosmovision of the community. For example, the practice of rotating 2 years on, 8 years lying fallow – was so that the soil had a chance to fully recuperate itself naturally, drawing in wildlife that assisted in this recuperation process. Milpa is part of the surrounding ecosystem, not separate from it. There is an automatic ‘we’ and commons mentality through the language and the practice of nourishing different foods cultivated traditionally with the milpa. I first encountered the rhetoric and politics of food sovereignty during my time living and working in Pakistan (2004), amongst different social movements – the People’s Rights Movement and the Fisherfolk Forum (both of whom had significant impacts on my life through the political awareness I gained spending brief periods of time with them). The People’s Rights Movement support landless peasants in their continual struggle for land rights (and continue to face violent conflicts with the military). The Fisherfolk Forum supports fishermen along the Indus River that crosses Pakistan from North to South and the Arabian Sea along the southern border. Due to unsustainable and industrial fishing (trawling) by companies that were supported directly by the military (Pakistani government), traditional fishing practices have become increasingly obsolete, forcing many families further into dire economic poverty. 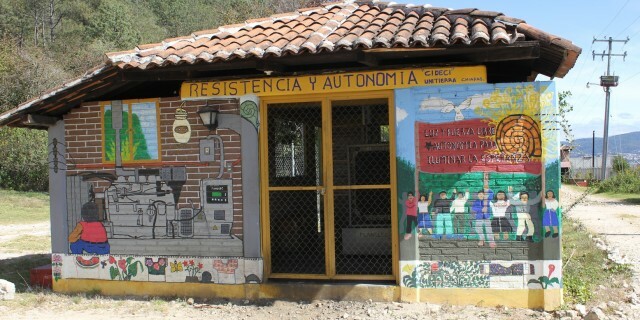 Both of these movements essentially support communities that have and continue to be deeply marginalized because of their lack of access to land, to water, to plants and animals that typically would sustain themselves, their families and their communities through a ‘commons’ – a communal and self-sufficiency orientation toward agriculture and food cultivation. Five years after time I spent in Pakistan, I attended the World Social Forum in Belem (Brazil) in 2009. As the World Social Forum gathers together such a large number of activists and civil society organizations, individuals and groups committed to food sovereignty (Via Campesina – peasant movement – being the largest social movement in the world) I attended as many food sovereignty workshops as I could, to learn more. I remember, in Belem, engaging in many conversations with people from Latin America about the ‘food crisis’ that many of them were experiencing – the prices of corn, rice, sugar having risen dramatically over recent years, due, in great part, to food speculation in the financial market. In Mexico, in 2008, because of the hike in maize prices, the country went through a ‘tortilla crisis’. 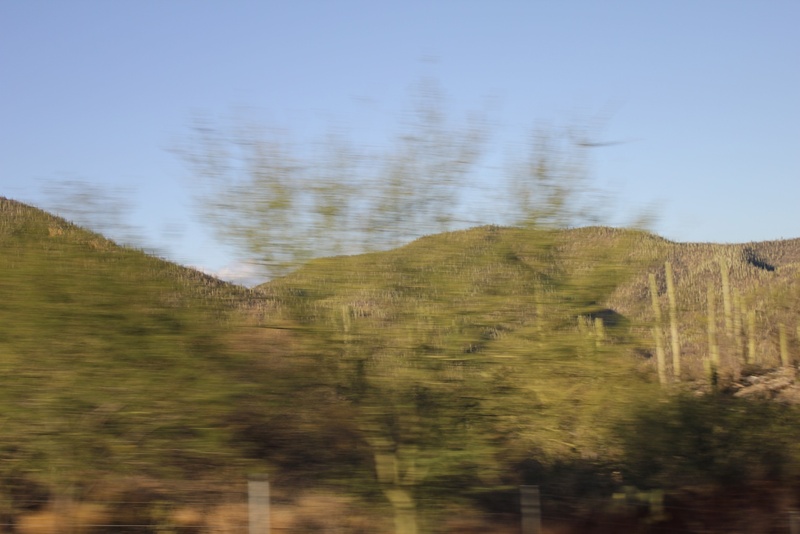 The Mexican government acknowledges that this has led to at least 28 million people in Mexico to be under-nourished and under-fed – 20 million of these are rural-dwelling and indigenous peoples. The ‘retreat to subsistence’ that Canby writes about is essentially what Unitierra is aiming to strengthen – as identity and as practice. The point is to move beyond the need of having to buy food – of having to depend completely on the market to access an adequate and healthy food supply. Unitierra is helping many communities in and around Oaxaca (Gustavo told us at least 25) to re-learn and strengthen milpa cultural and technical practice. The orientation of food is further supported by learning about autonomy and self-sufficiency as associated with waste, water, architecture and political action, all the while celebrating community through fiesta. Alfredo Aceda tells us in his recent article – The Fight for Corn – the Nobel Prize winner Octavio Paz once said that ‘the invention of corn by Mexico is only comparable to the invention of fire by early humans.’ This is due to the incredible cultural and economic role that maize has played and continues to play within the majority of countries around the world. Maize is the most efficient producer of any grain in the world – for example, the yield per hectare of maize doubles that of wheat. 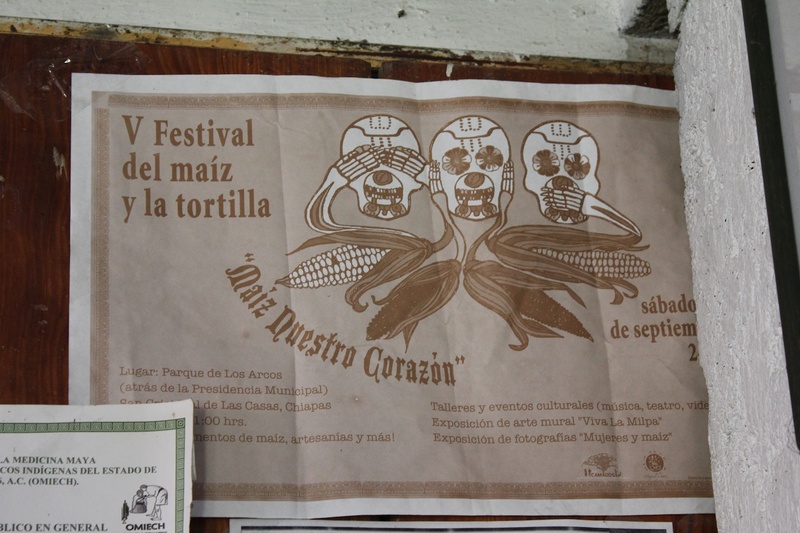 During our time in Mexico, my senses and emotions endured a steep learning curve about maize (corn). I tasted maize in many forms everyday – tortillas – with cheese, nopal (cactus), frijoles, in soups… chips (the nacho kind of chips), enchiladas, tamales… How I love tamales. Hector and Margarita, the warm and generous couple we stayed with in Oaxaca, made tamales several times during our stay with them. Each time I was lucky enough to have a vegetarian tamale on a plate in front of me, I was suddenly a little girl again, eating tamales with my babysitter, Mrs. Bravo, who had come from Mexico. It was like coming home… what a contrast to the bland industrialized and ubiquitous manifestation of corn across virtually all US-processed foods in the form of corn syrup (which by the way, is directly related the tremendous rise in obesity). Yet, aside from these delectable delights, I also found myself becoming angry. Frustrated. Enormously. Again and again. Learning more about Monsanto, the multi-national corporation (MNC) that controls the majority of the international maize market – and the terrible ways they continue to extend their sharp claws into all aspects of the production of food in Mexico, from seed to consumption, manipulating not only economic security, but strangling cultural and ecological longevity as well. The tight grip of Monsanto’s claws further destroys any promise of equality – deepening poverty, constraining autonomy and self-sufficiency, darkening spiritual illumination that glows from communal agricultural practices in milpas within which, technological knowledge still continues to marvel new learners (such as myself), 7,000 years after the domestication of maize first began. In essence, Monsanto is poisoning the land, the water, the food and thousands of years of cultural history. 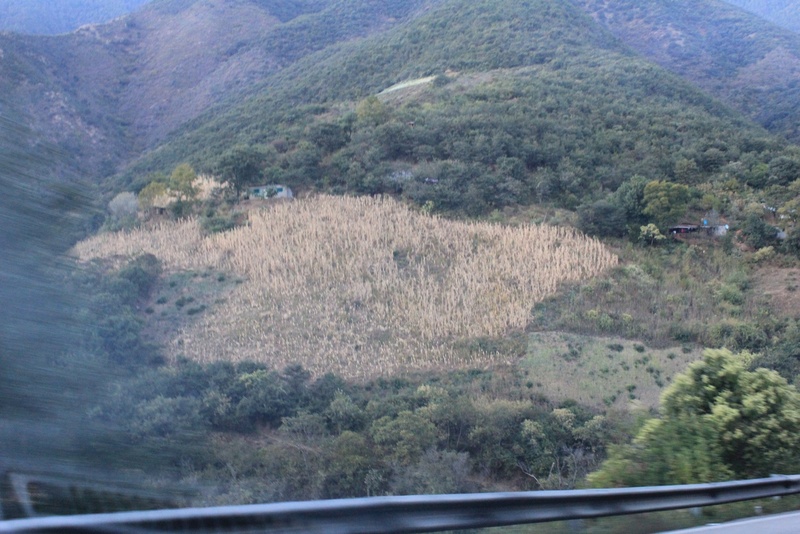 It seemed that every time I turned around in Oaxaca and Chiapas, on a bus, in a colectivo taxi (car shares that cram as many people as possible inside to save money and petrol), in a café, in a museum, on a street corner… I came face to face with some formation of maize. From the front seat of the colectivo taxi as we drove from the city of Oaxaca to the village of Guelatao to visit with Jaime Luna Martinez, I appreciated field after field of golden maize growing tall and proud up the sides of steep hills. 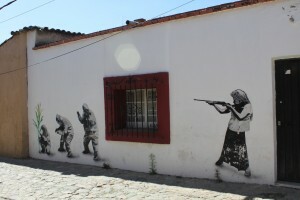 On various street corners of Oaxaca city I encountered graffiti art of all kinds – many with an image of a corncob or field of maize, my absolute favorite being the image of the indigenous woman pointing a gun at GMO culprits, sneakily trying to plant trans-genically modified maize (see Udi’s post on Art of Rebellion). 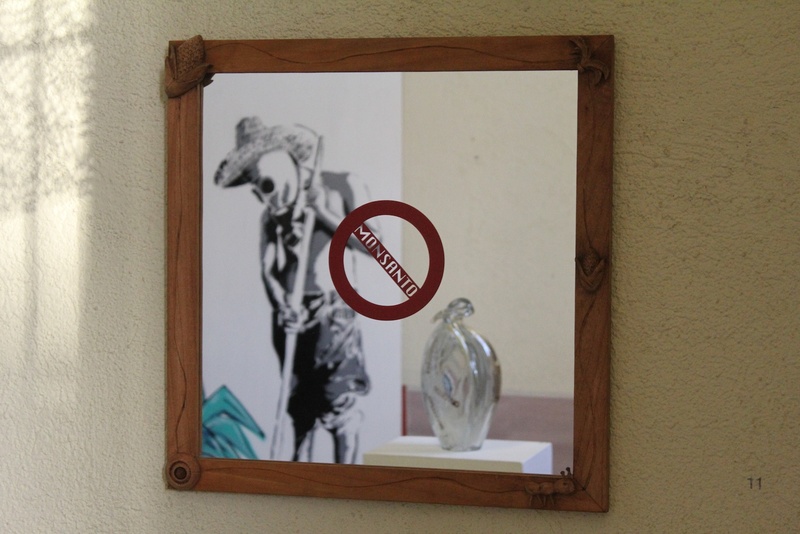 In Jardin Etnobotanico de Oaxaca (the botanical gardens in Oaxaca) I visited an art exhibit celebrating the cultural significance of maize and damning the intrusion of Monsanto in paintings, sculptures, paper cut-outs and stencils. 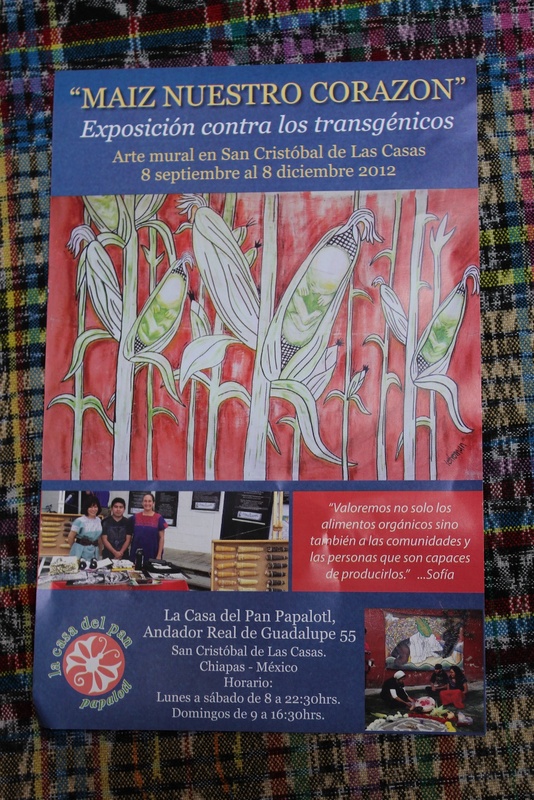 An organic café and cultural center we discovered in San Cristobal (Chiapas) was holding a month-long Viva la Milpa! exhibit and series of events to spread awareness of the necessity of blocking the plantation of trans-genetically (GMO) bred maize. 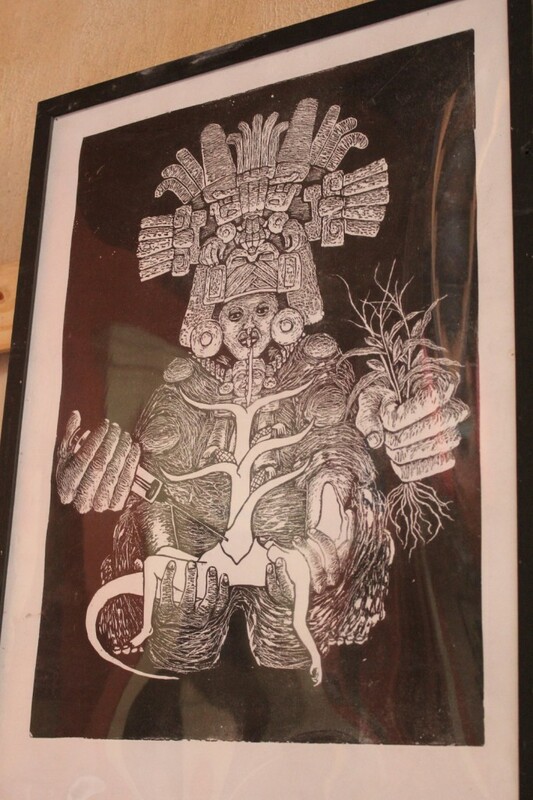 Within this exhibit was a poster showing at least 20 different native types of maize, endemic to Chiapas, multiple black/white posters celebrating cultural nuances and histories of milpa and others again condemning Monsanto through informative and violent imagery. I was repeatedly surprised to have to request tortillas specifically during many meals out and about in Oaxaca and Chiapas. The majority of times white bread would automatically arrive at our table in a basket. Hector and Margarita informed us that tortillas had become too expensive because Mexico was importing so much of its corn (approximately 1/3) — and that 20 years ago 99% of Mexico’s corn was grown inside the country, thus maintaining autonomy of its cultivation and consumption of maize within its own borders. Aside from the dramatic increase in imports, many rural Mexican families are producing maize for their own subsistence. The availability of Mexican maize entering the Mexican market is decreasing every year. The direct impact of the North American Free Trade Agreement (NAFTA) was beginning to become more clear. I have read many accounts of the profoundly unjust impacts of NAFTA on Latin American countries (primarily rural and indigenous peoples) and this was just one example. So where did this dramatic change towards a relationship of dependency and return to subsistence come from? The answer is very complicated – an entanglement of historical forms of colonialism, elite power, unforgiving regulations and legislation that are all orientated toward the generation of profit (before and above anything else) through the industrialized expansion of the free market and the erosion of self-sufficiency, where people have lived off the land, nourishing its cultivation, over thousands of years. Trying to write about this entanglement has led me through several drafts of this post – stops and starts… overly strong statements within which I have veered toward the safety of academic-style writing where I notice myself becoming distanced from what I am really trying to say. Especially when I try to articulate (in a brief and simple way) the details and impacts of the North American Free Trade Agreement (NAFTA) on the majority of people living and working in Mexico. Rather than provide a long, complex explanation of the devastating effects and supposing promises of NAFTA, I mention a few of the related issues and problems. 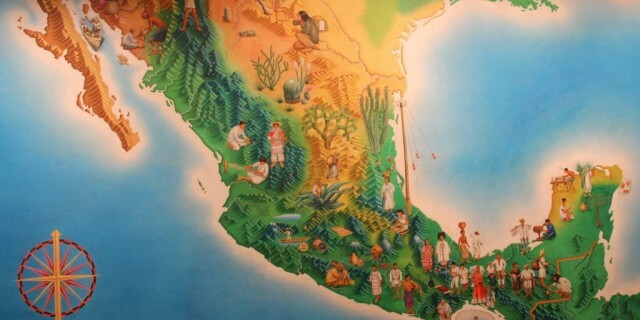 The decision to throw Mexico wide open to free trade was due to the government’s belief that the geographical and climatic conditions in Mexico favored increase exports in fruits and vegetables to the United States. Although Mexico is the original producer of maize (there are 60 ‘landraces’ and thousands of native varieties in Mexico which have evolved over thousands of years), the US has a stronger market advantage because of the genetically modified versions of corn they cultivate, which produce greater yields and are greatly supported by government subsidies (and are also completely dependent on huge amounts of fertilizers and pesticides which is poisoning water and land particularly in the Mid-western part of the US and increasing rates of cancer). Tariffs on corn entering Mexico were also eliminated through NAFTA which has devastated the Mexican market aside from the strength of rural farmers. 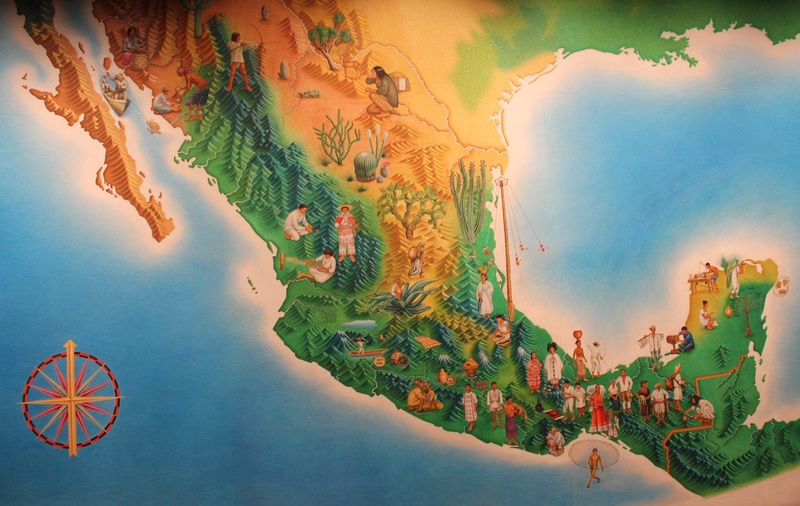 In the book, Sin Maiz, no Hay Pais (without maize there is no country) a book on Mexico’s maize crisis published in 2003, from which this post is named, there were statements provided from the government saying that they hoped to remove half of the population of Mexico’s rural areas within five years. Since coming into being in 1994, NAFTA regulations essentially force food to be cultivated for profit-making purposes to enable ‘free’ trading to occur between countries in the Americas. Yet, as I learned many years ago through visits with social movements in Pakistan, participating in the World Social Forum (2009) and friends of mine in Oregon who are farmers — the ‘free trade’ aspect is prohibited in multiple ways. For example, farmers from the United States receive vast subsidies from the US government every year which enables them to sell their foods more cheaply on the international market, thus creating a dependency for southern American countries to import foods as they cannot compete with prices (such as maize) that has historically grown very readily on their lands. This has made it exceedingly difficult for small farmers from Mexico to sell and export their maize and to cultivate native landraces of maize that are endemic to Mexico as they are not as productive (large yields) – and are thus priced higher than American GMO-bred corn. In addition, the intrusion of trans-genic seeds contaminates native varieites in Mexico. 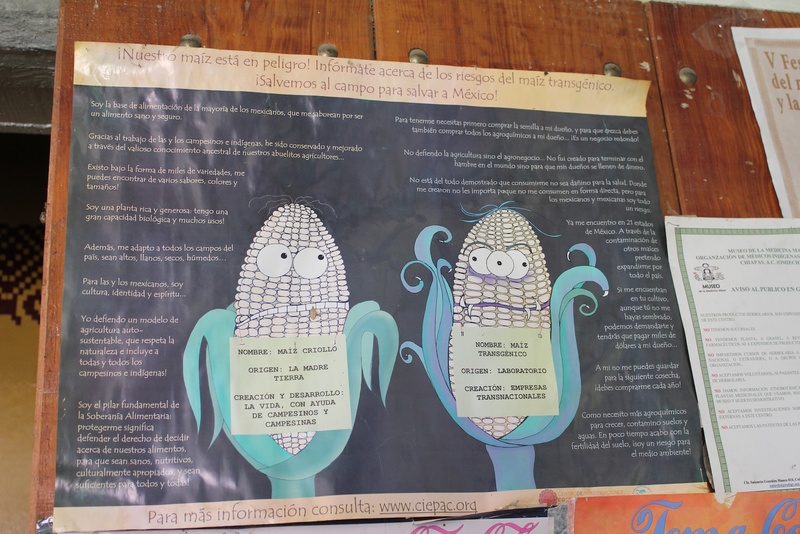 Although there was a moratorium placed on GMO seeds entering in Mexico until 2009, contamination was found in remote parts of Oaxaca as early as 2001. With the moratorium now ended, trans-genic maize seeds are freely circulating, although full planation is still resisted (though barely – legislation allowing Monsanto to plant 2.5 million hectares in Mexico this month almost passed). The financial constraints that have ensued as a result of NAFTA has forced many Mexican farmers to produce very small amounts of food for their own family subsistence (which more and more are doing). 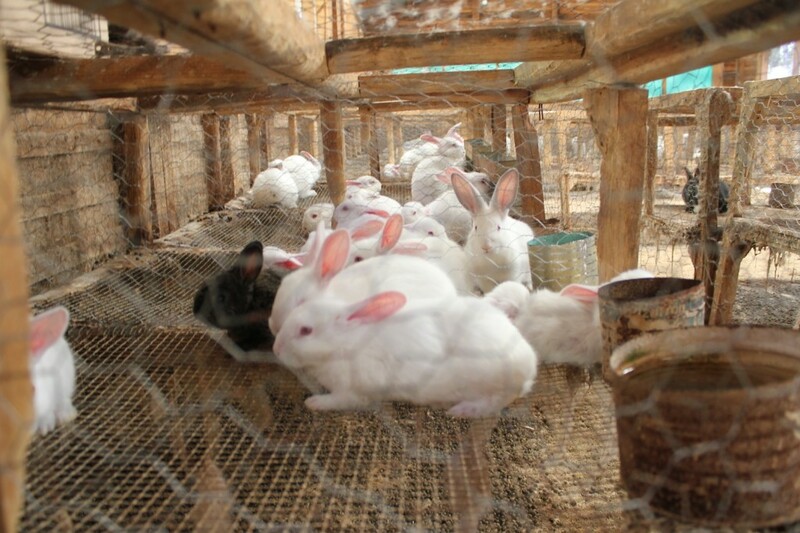 Many others (hundreds of thousands) migrate to urban areas (where there are often no jobs to be found – or very low-waged jobs) or attempt to cross the dangerous border illegally only to serve as wage labourers on farms (often picking fruits and vegetables in often-times hazardous conditions) in North America. Whilst the subsistence approach reclaims cultural and agricultural approaches to food cultivation (building food sovereignty), it also puts these farmers into a more vulnerable situation of economic insecurity which makes it that much harder to resist the intrusion of MNCs taking over and producing foods on their lands. 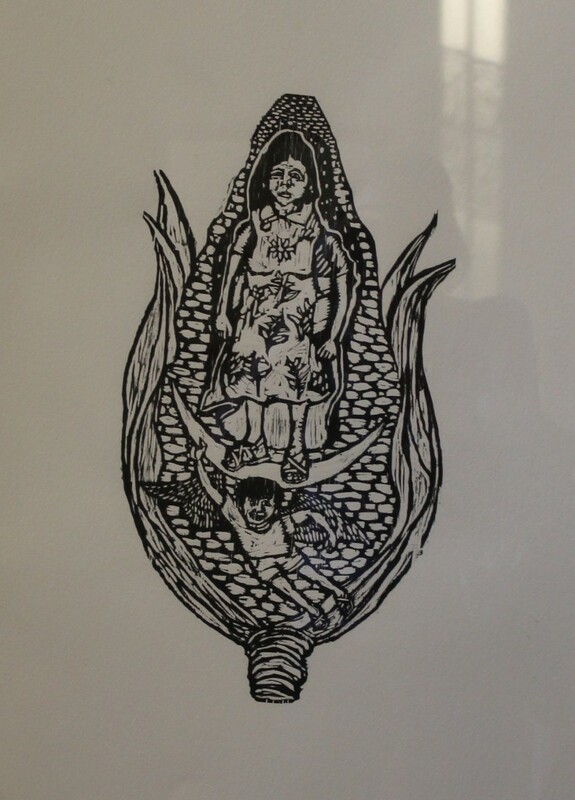 The commitment of Unitierra is exactly about supporting the strength of rural families to produce their own foods on their milpa, building strength of identity and community solidarity, working together to resist government and multi-national corporation pressure.